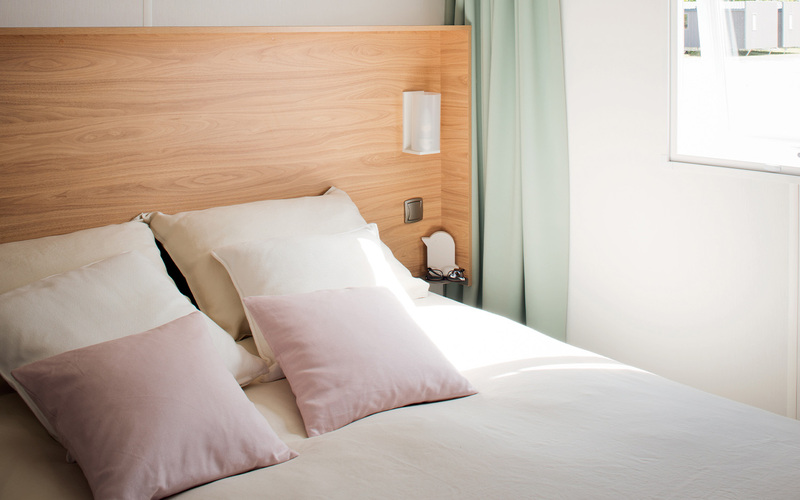 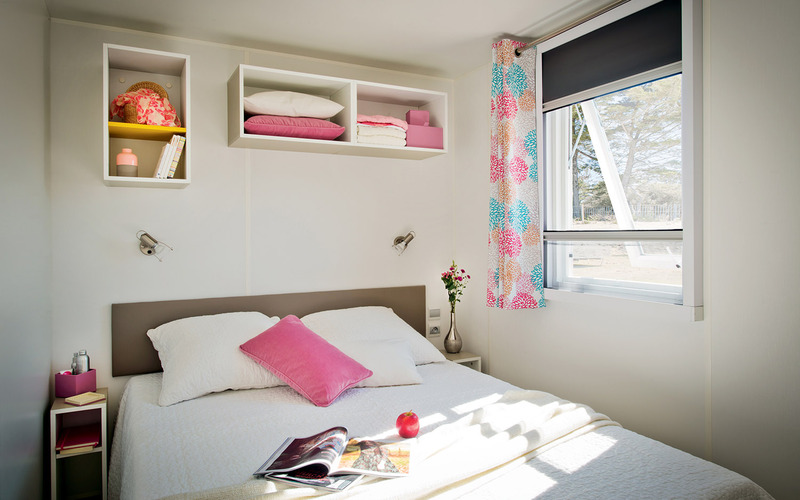 Find on this page all available accommodation for rentclassified by ranges. 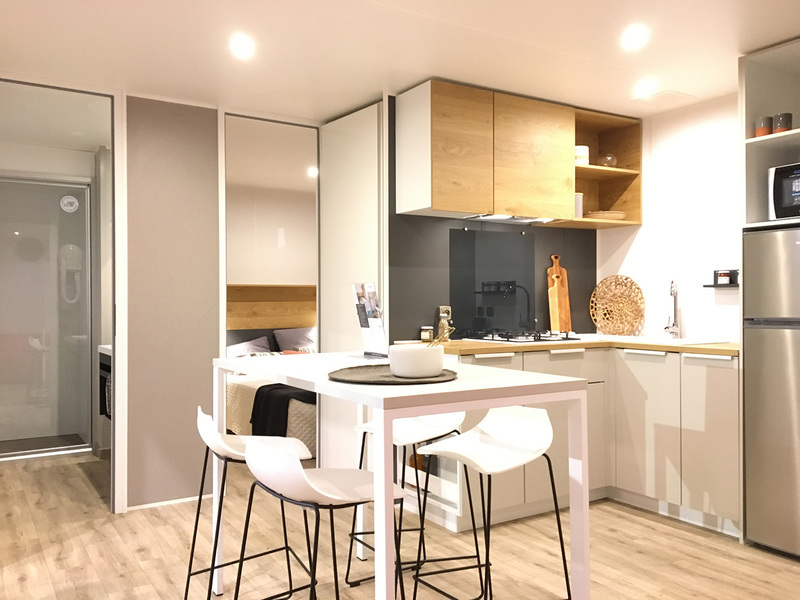 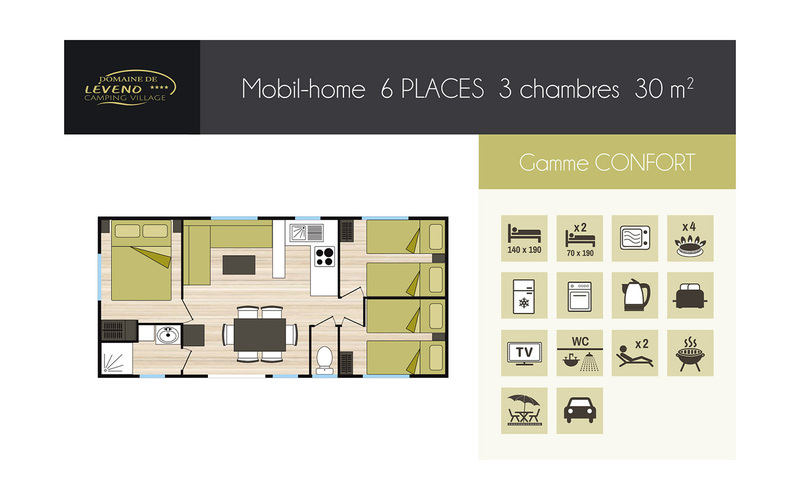 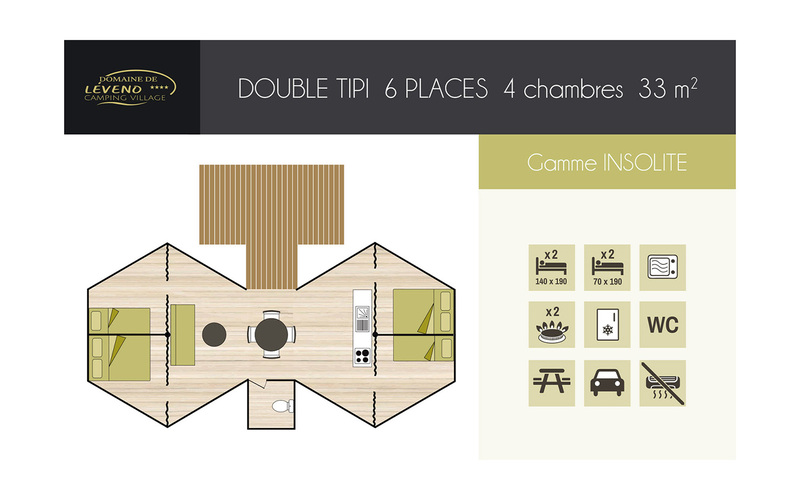 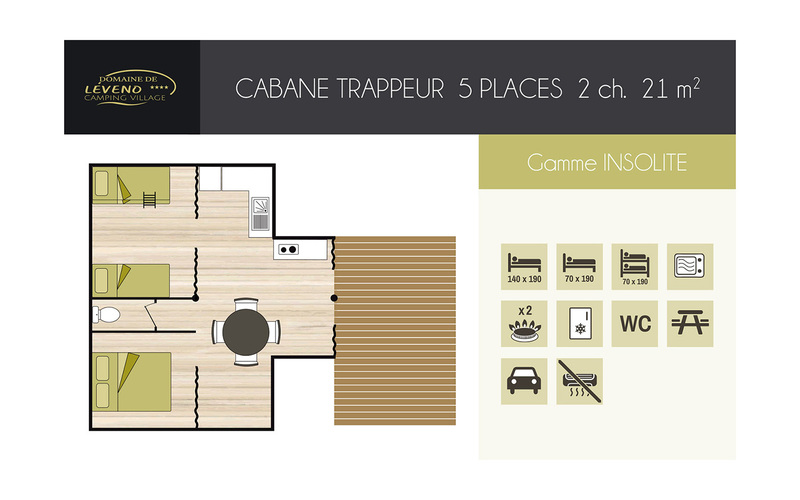 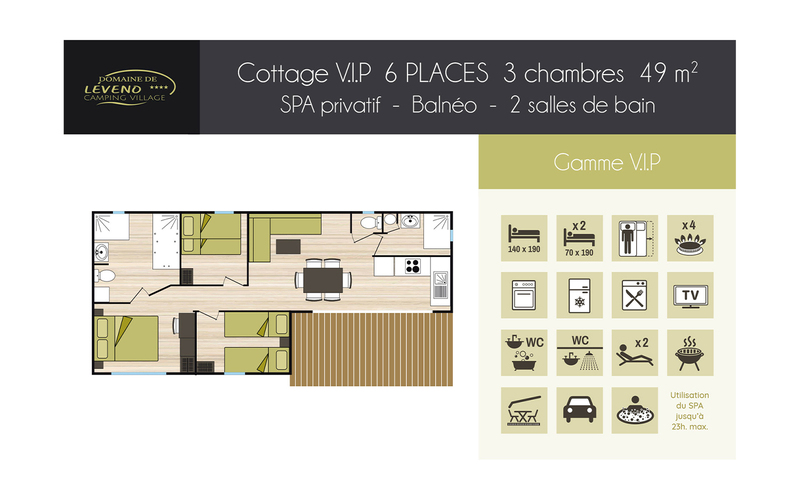 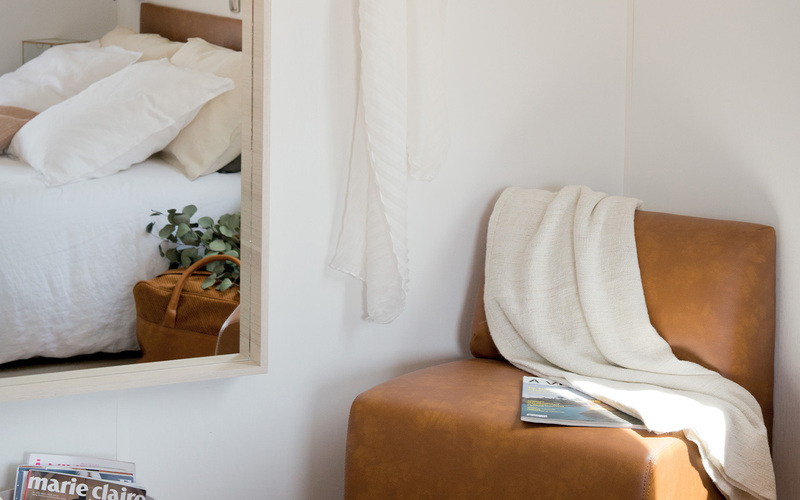 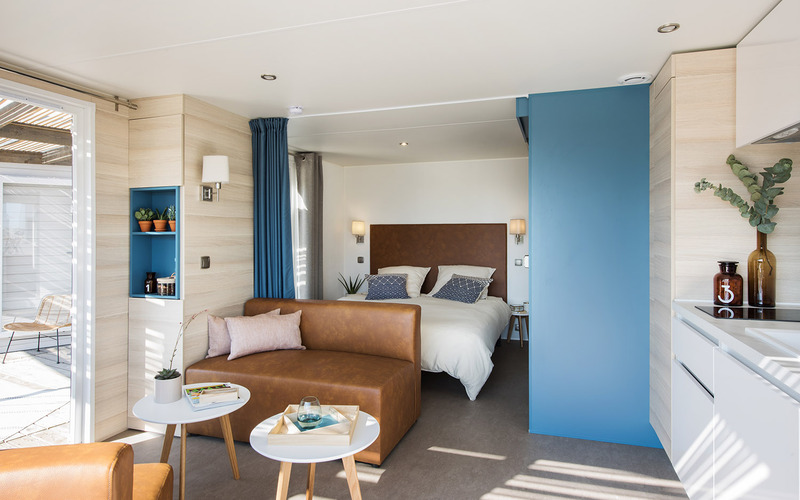 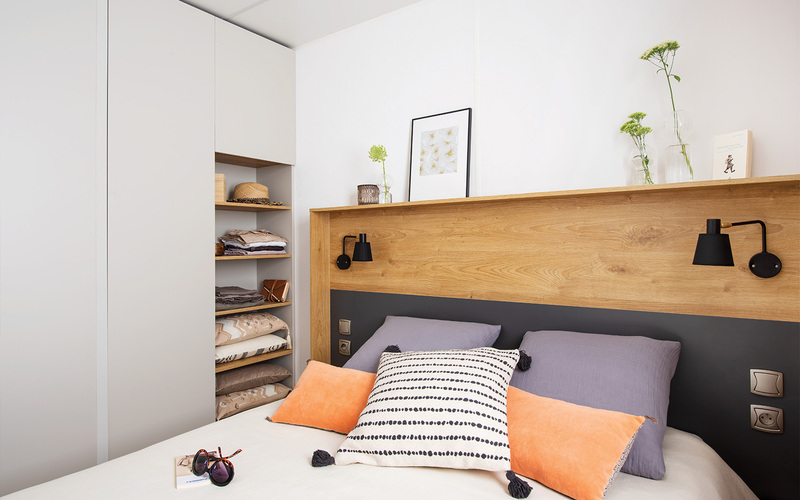 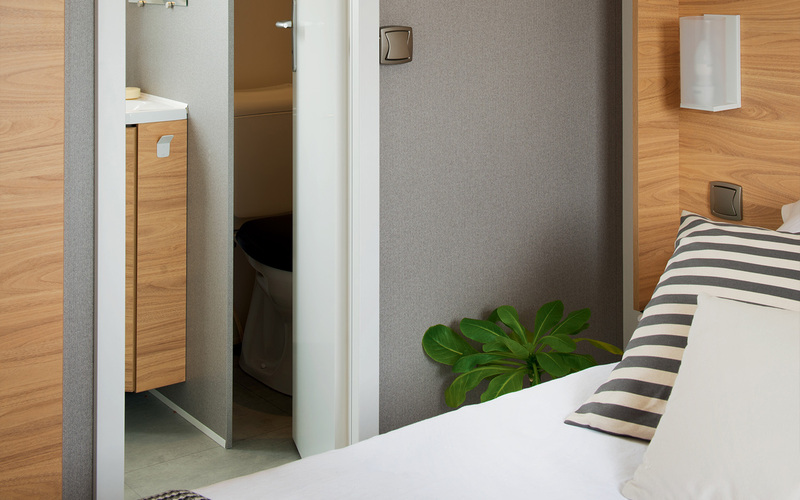 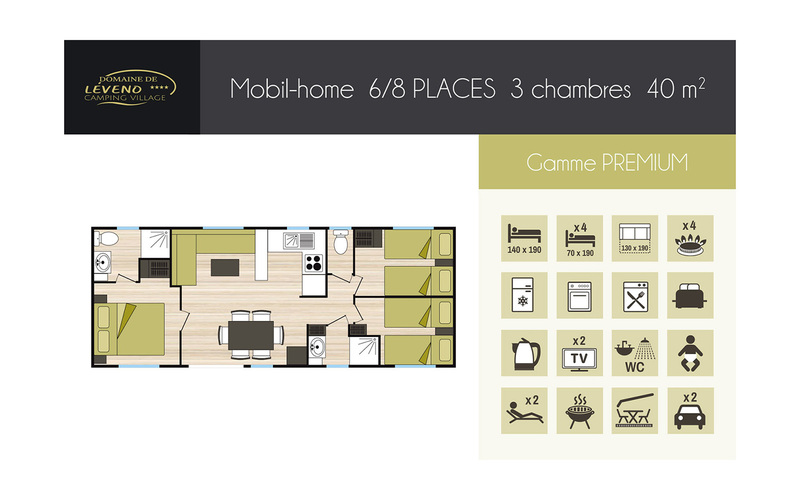 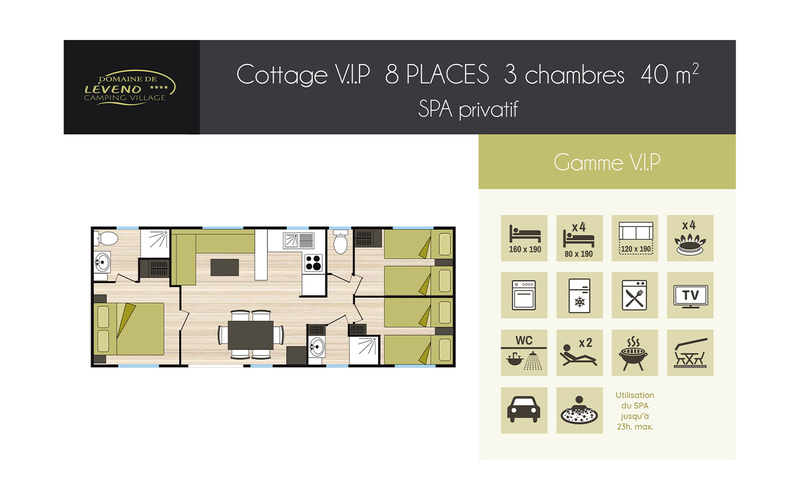 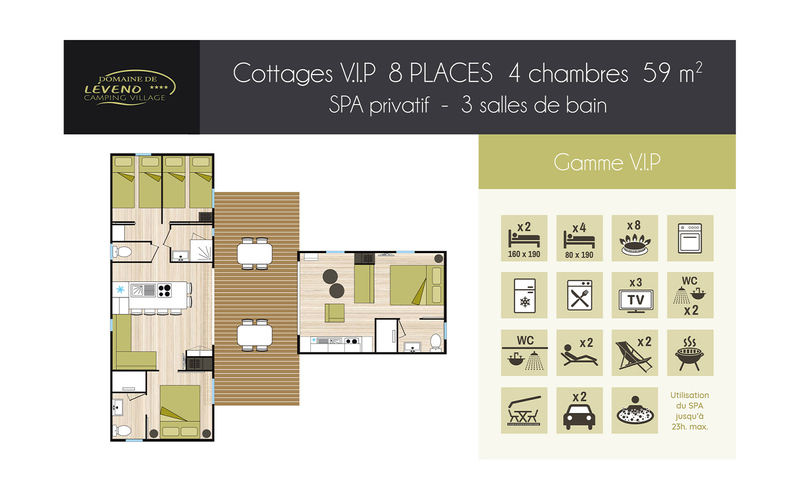 Discover the gamme VIP for superior accommodations , then range PREMIUM, the COMFORT range and finally the ESPACE range for simple and comfortable stays . 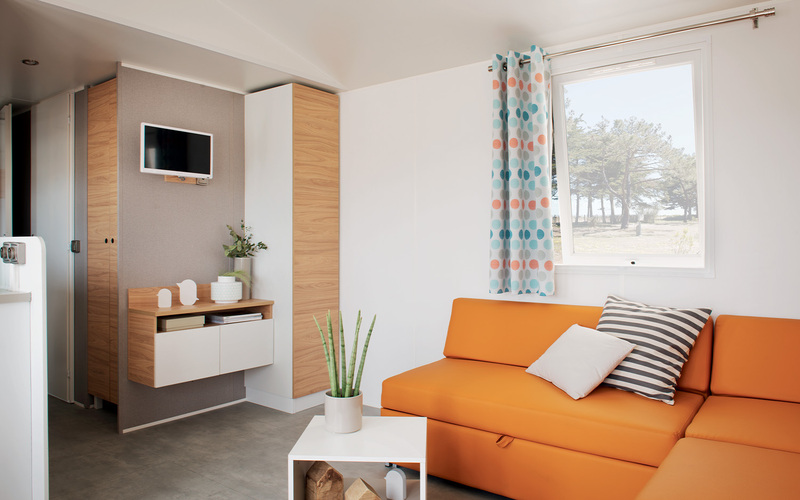 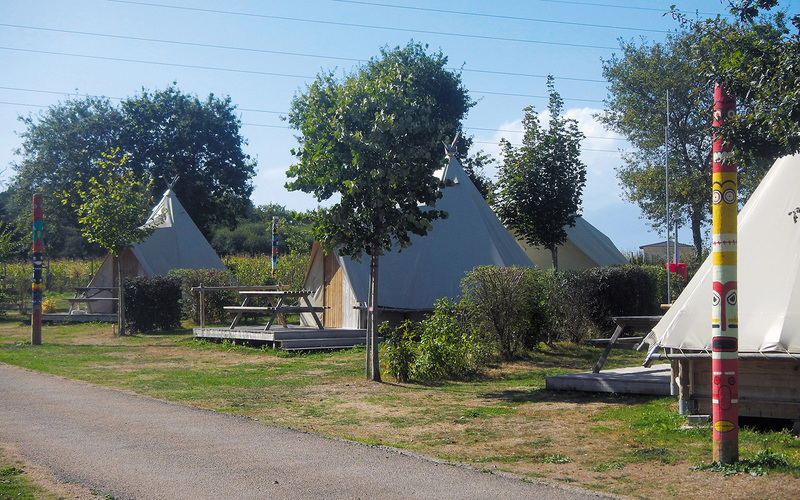 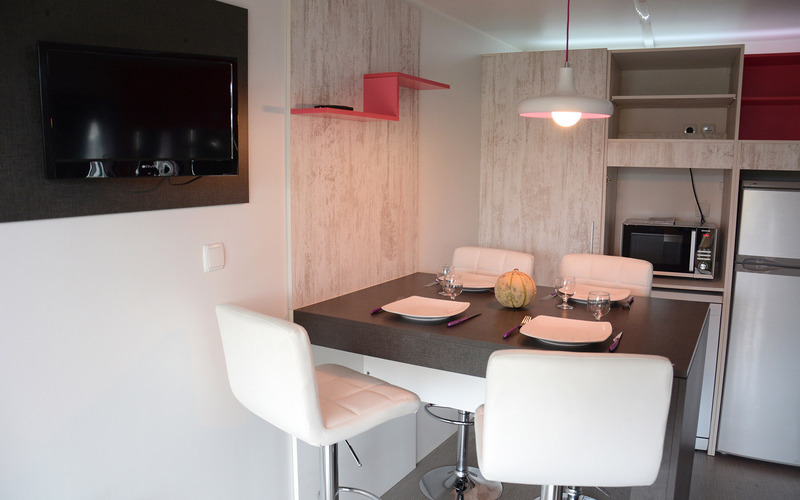 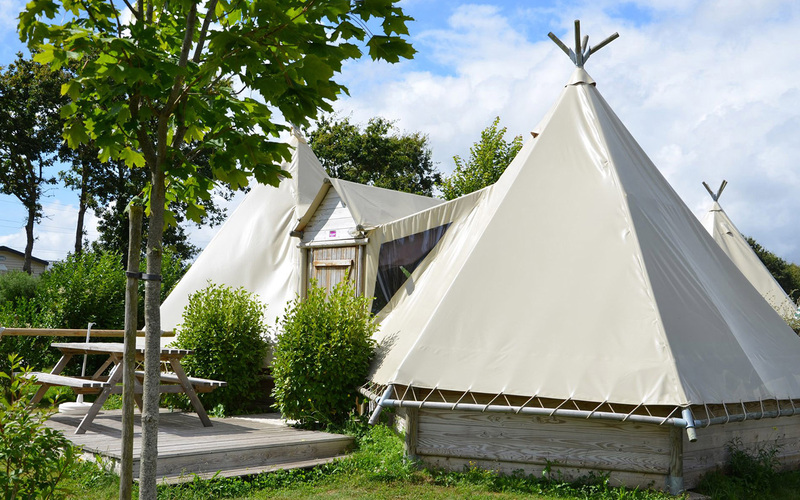 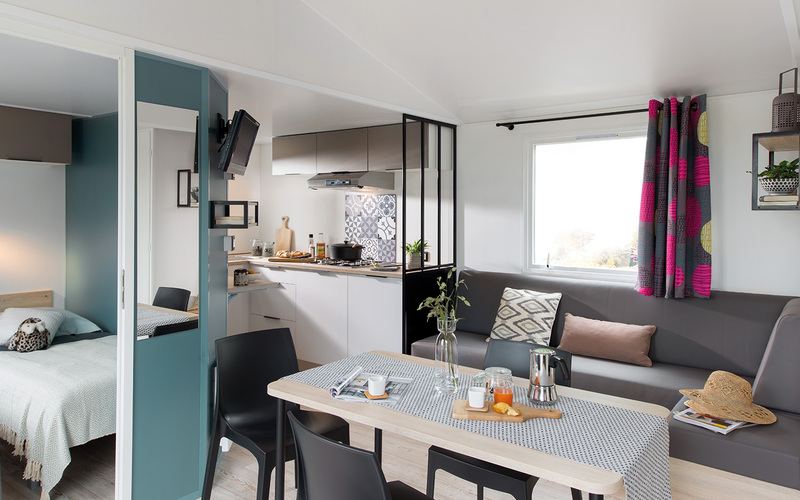 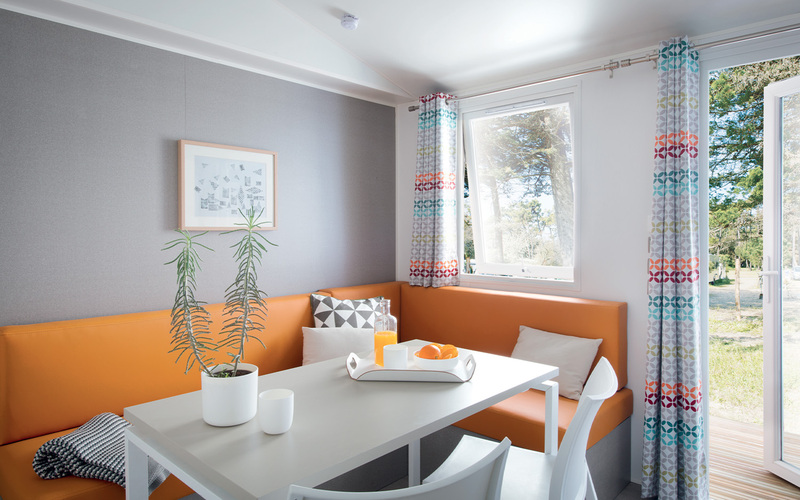 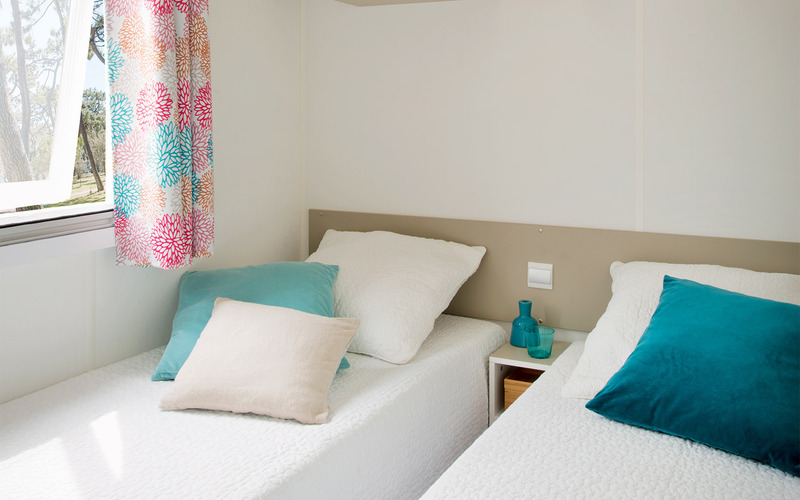 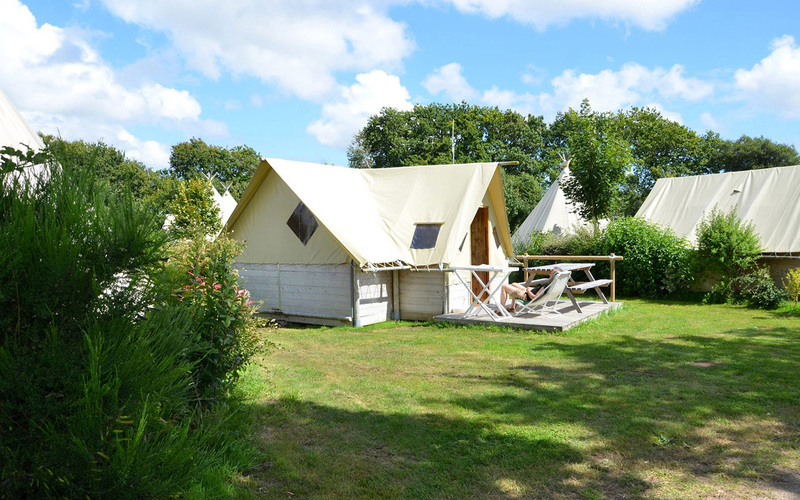 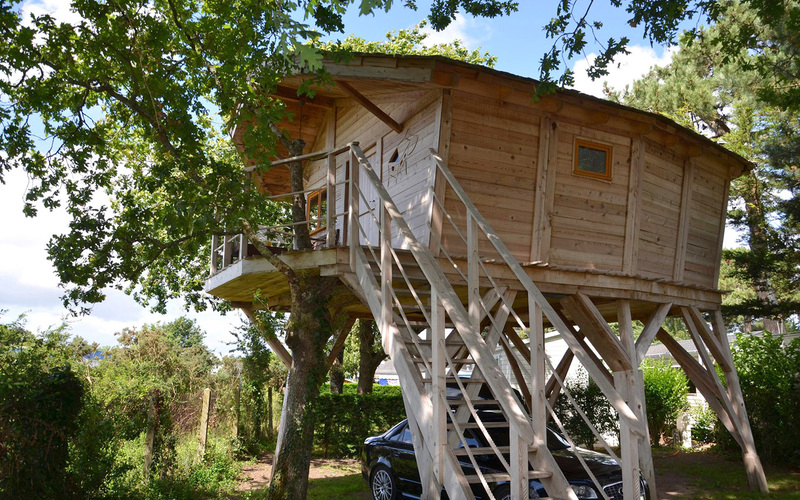 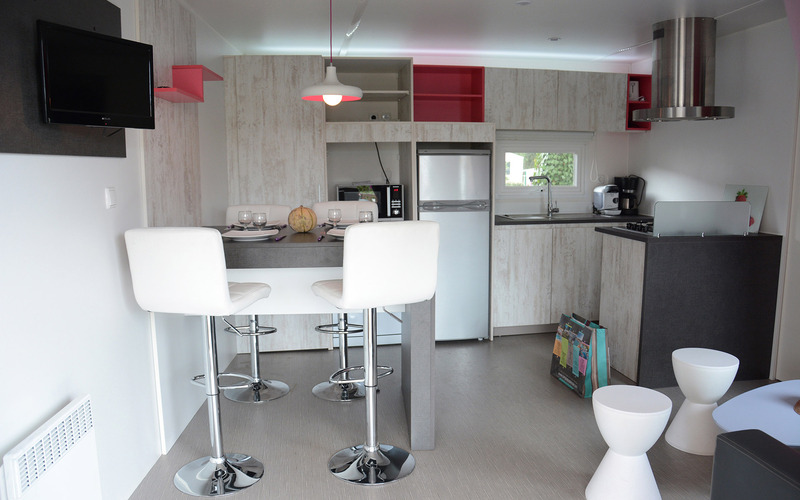 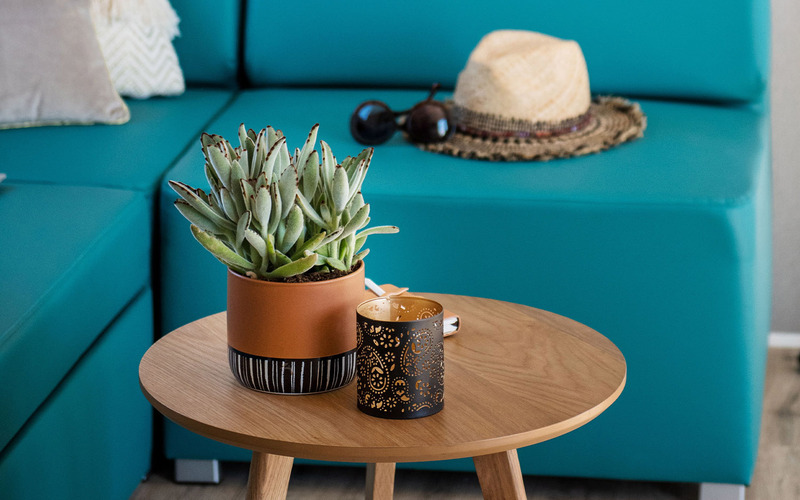 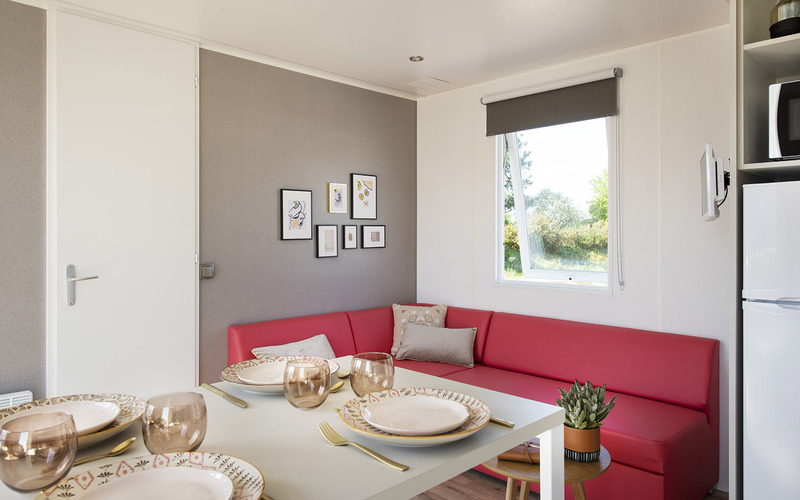 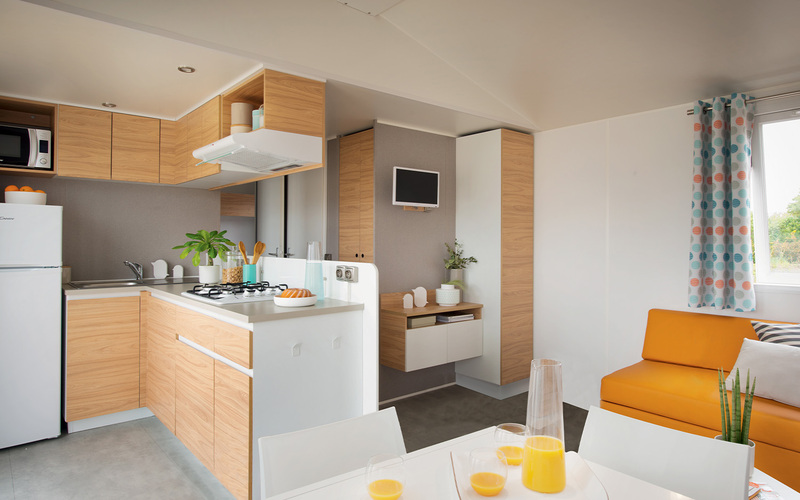 Your Guérande campsite also offers you an ECO range with cheap rentals in mobile homes from more than 7 years old For discovery enthusiasts and new experiences , the INSOLITE range is a must. 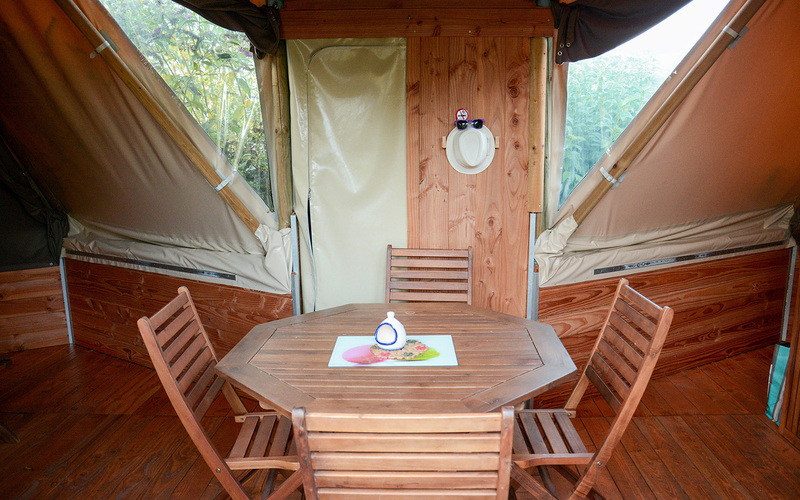 The reception team of the Domaine de Léveno is at at your disposal for any further information. 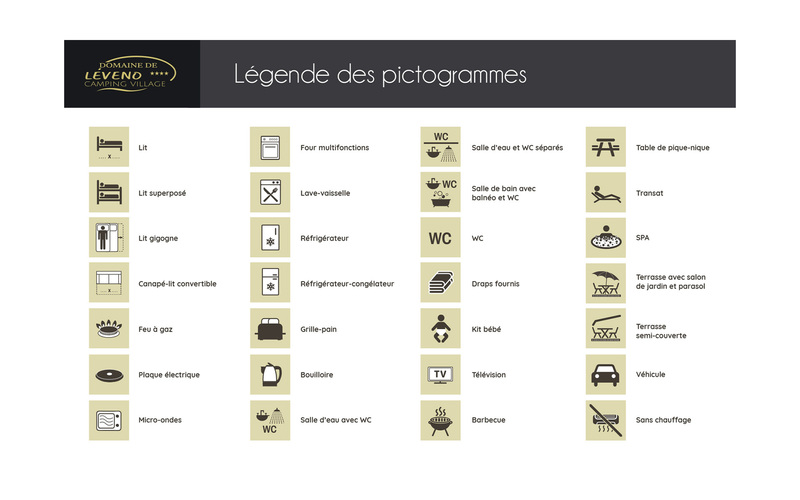 Find the telephone number in the drop-down tab on your right. 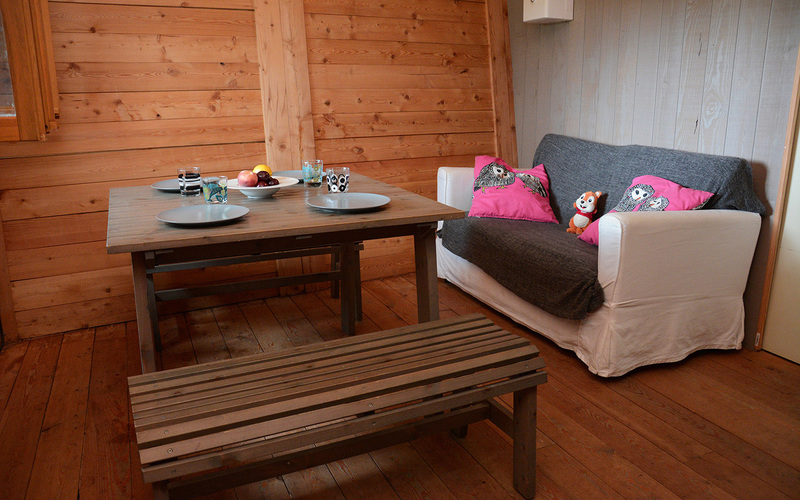 Good visit ! 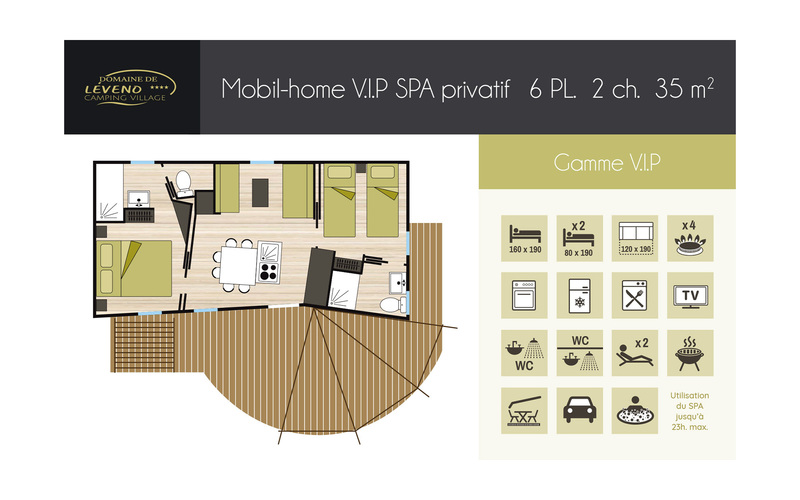 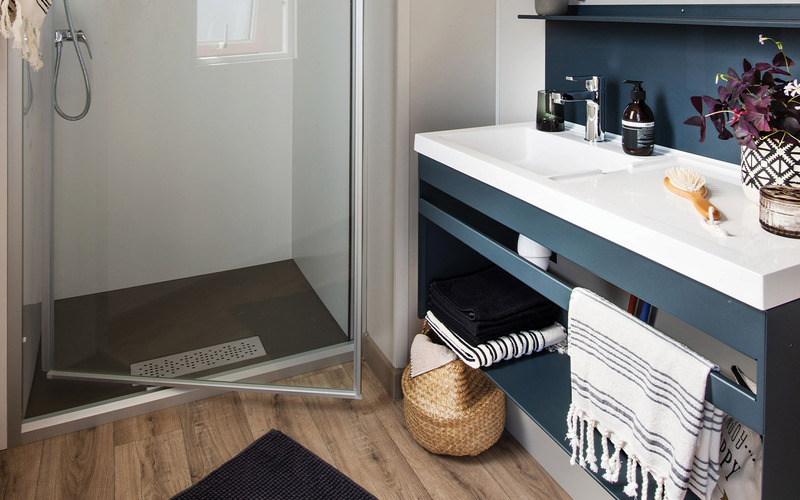 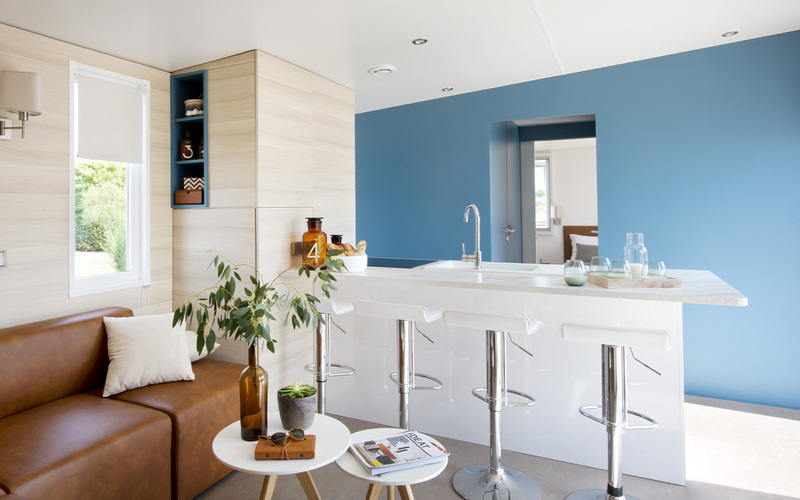 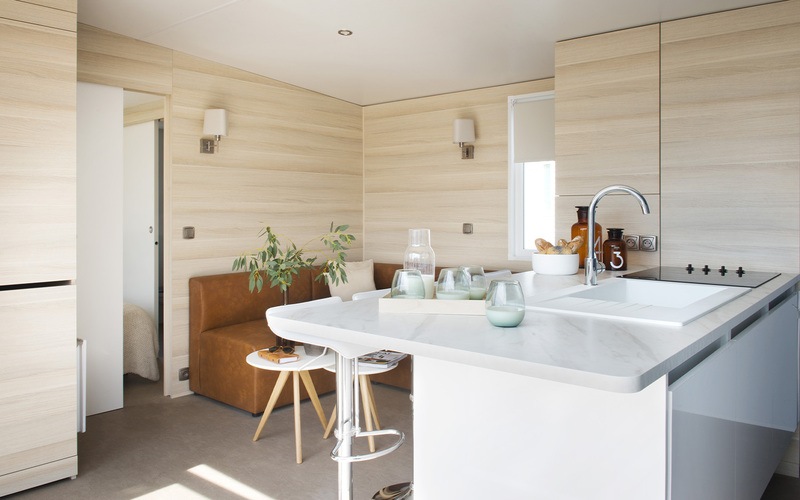 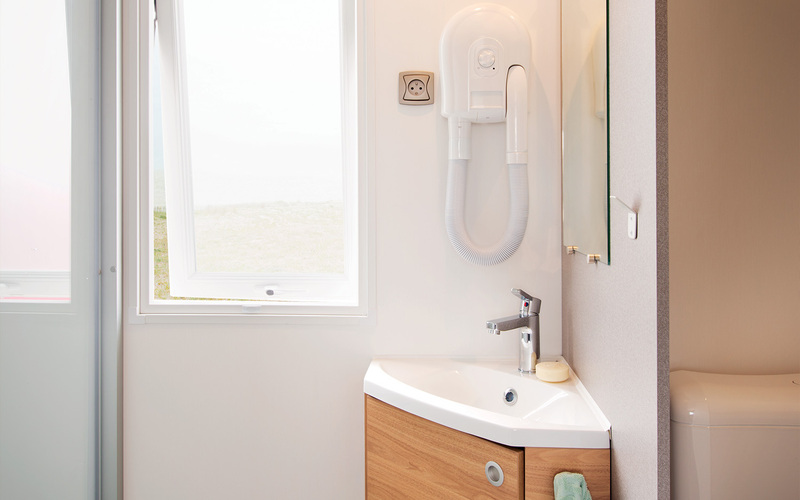 Private Jacuzzi and wide open spaces, meet luxury in mobile homes and chalets in the VIP range. 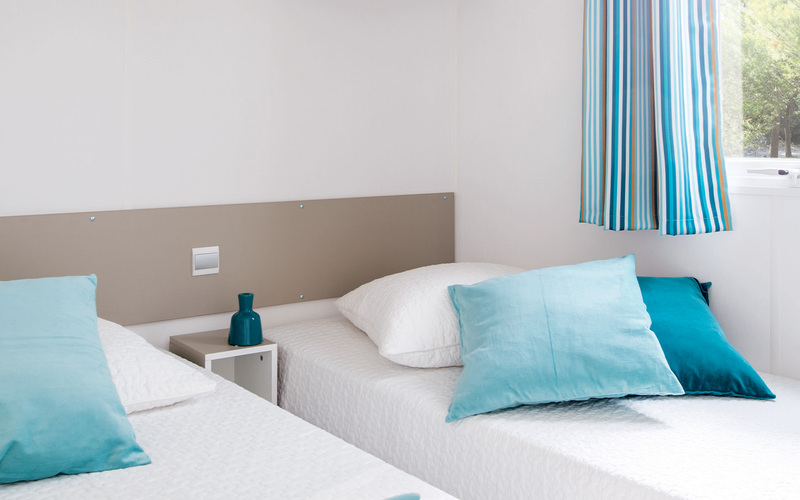 All the services of the other ranges are present in superior category accommodations. 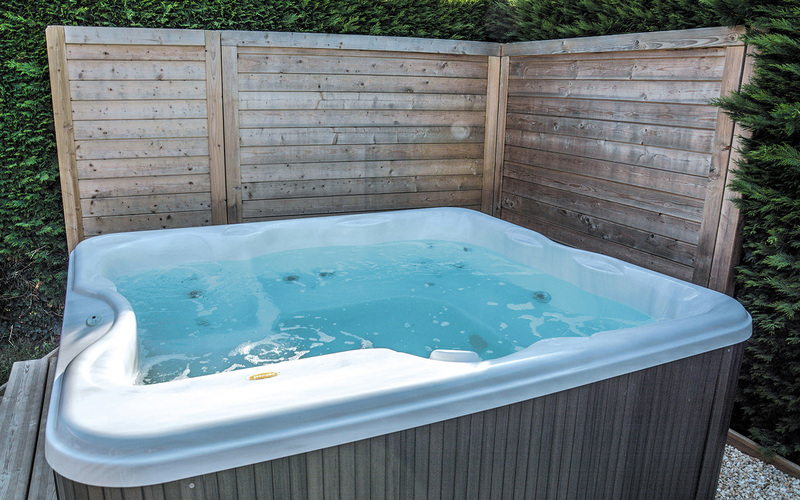 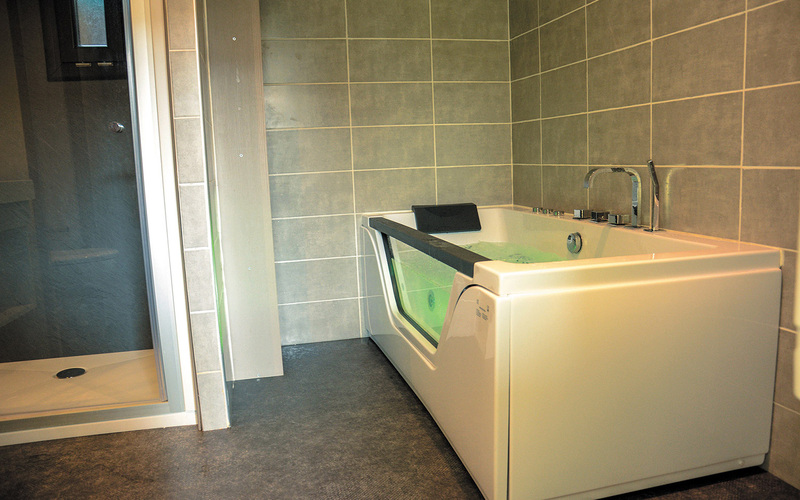 ADVANTAGES: : Equipment of the PREMIUM range with JACUZZI PRIVATIF. 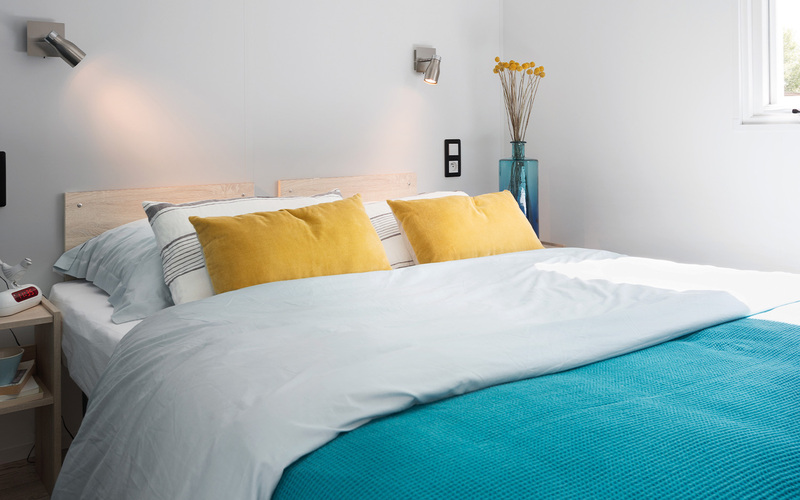 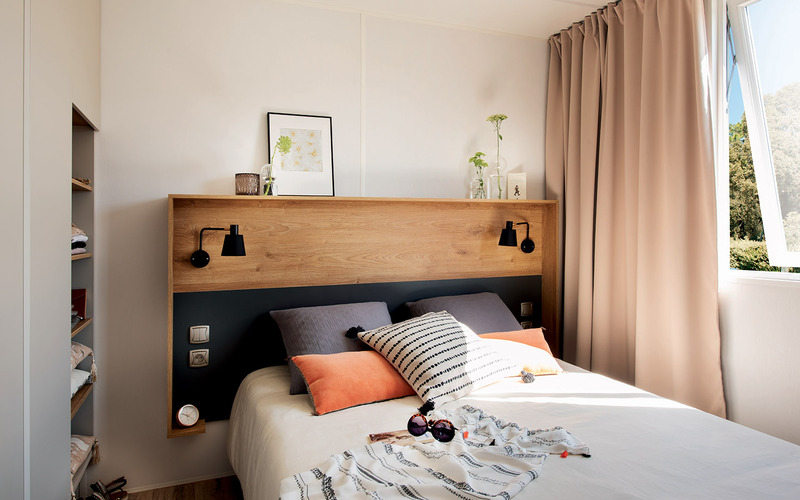 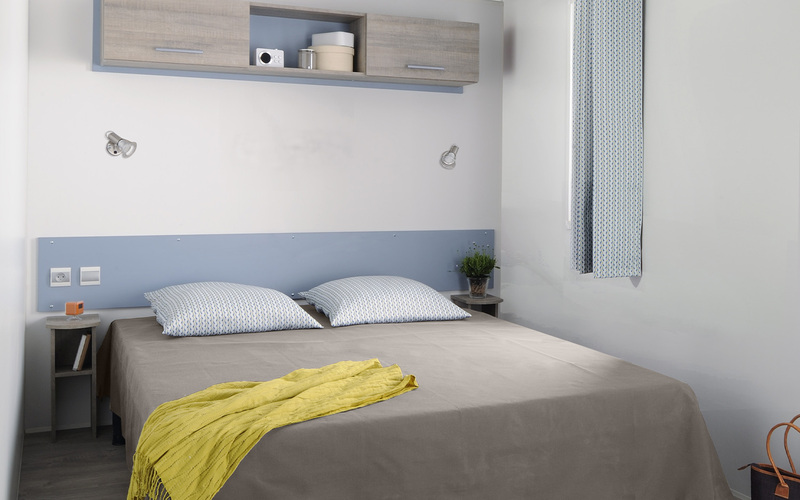 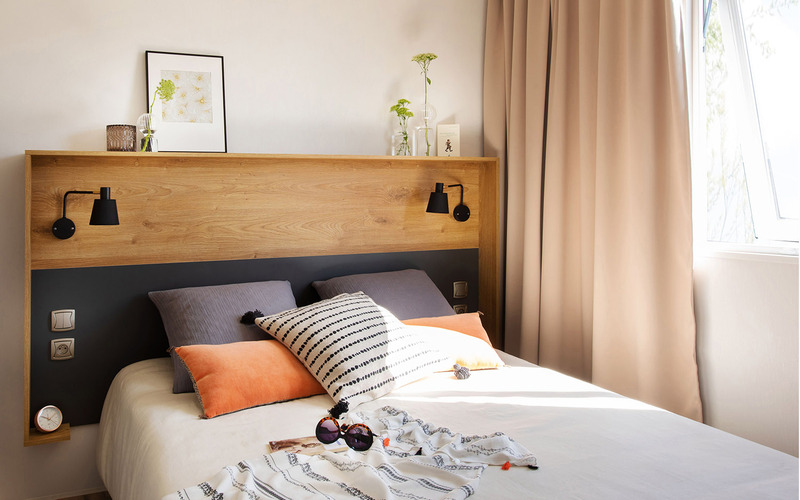 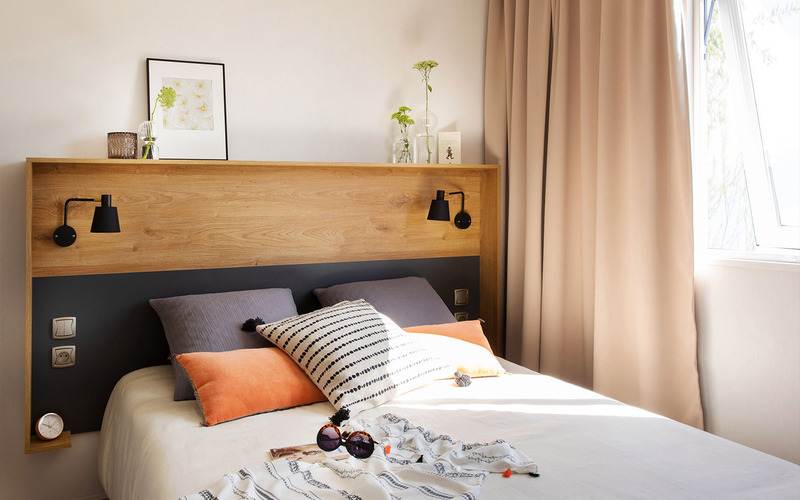 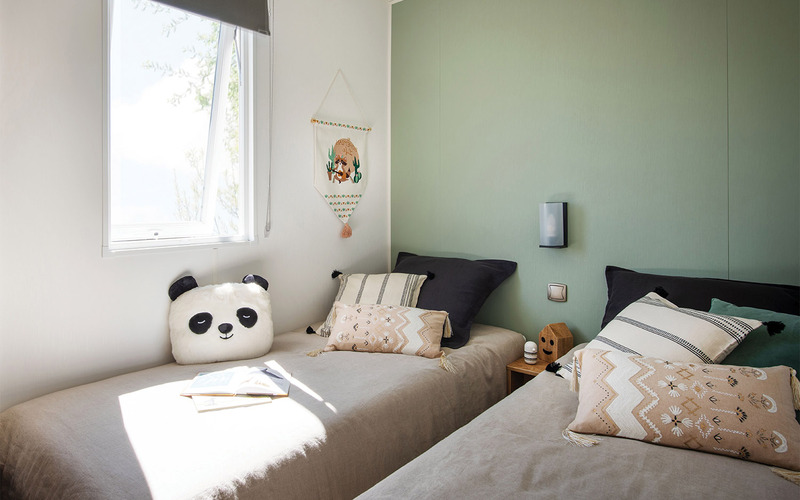 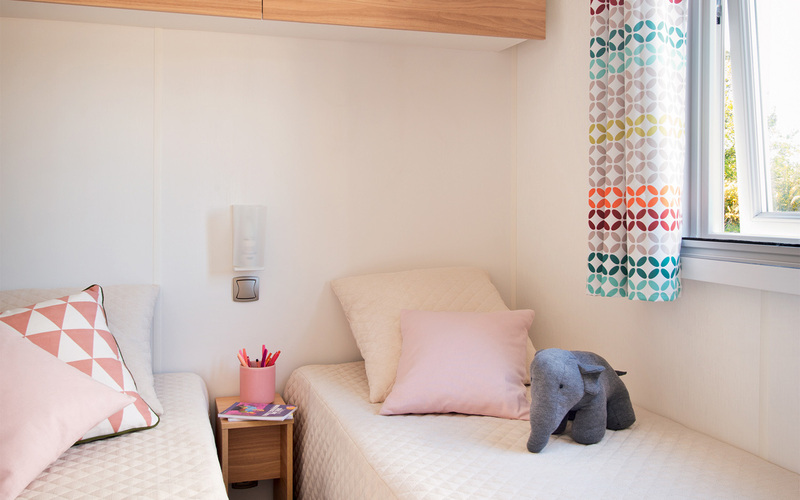 CHAMBRE CHILDREN: Duvets 140 X 200, pillows, mattress, 2 single beds 80 x 190 cm, bathroom with shower and toilet, heating ..
MORE: Superior category accommodations with all the benefits of other ranges and JACUZZI PRIVATIF. 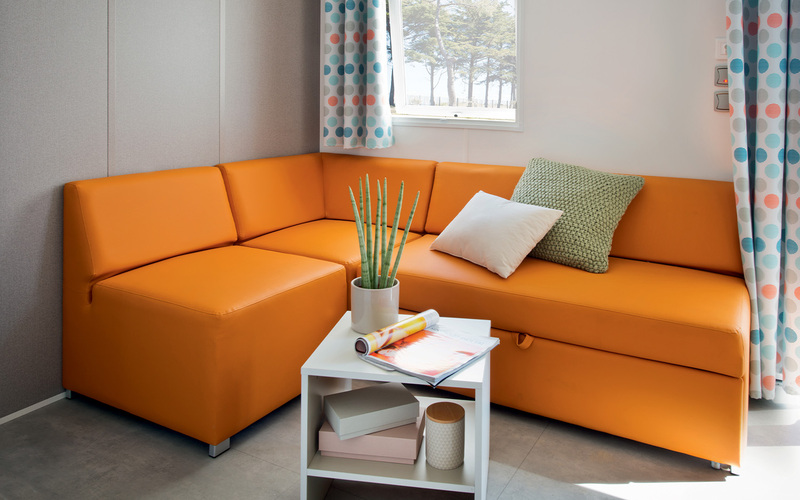 Model 2019! 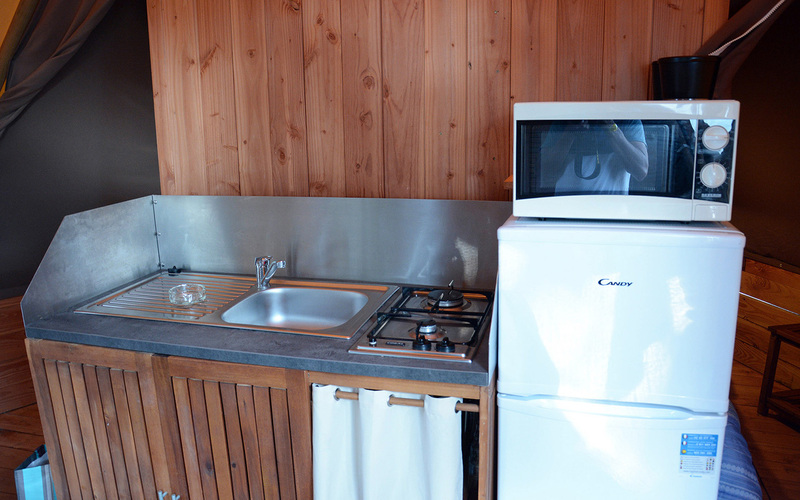 EQUIPPED KITCHEN: multifunction microwave, 4 burner gas hob, sink, coffee maker, kettle, crockery, kitchen utensils, fridge freezer, toaster, dishwasher. 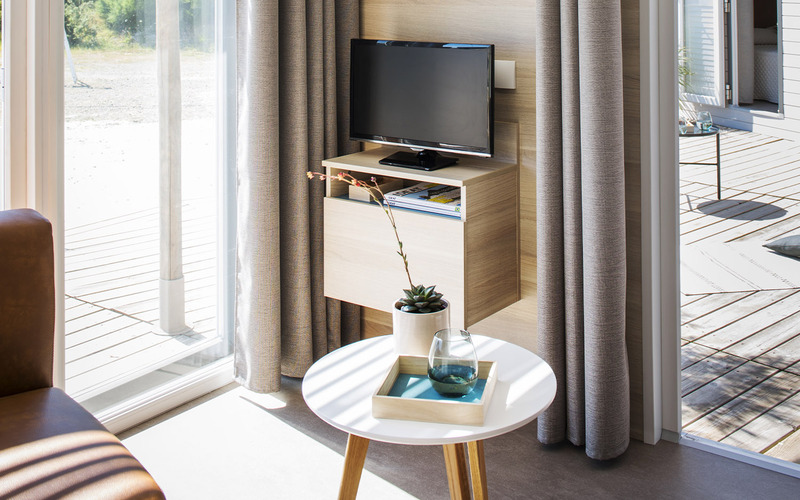 With the PREMIUM range, add to the benefits of the comfort range a TV in the master bedroom and a dishwasher. 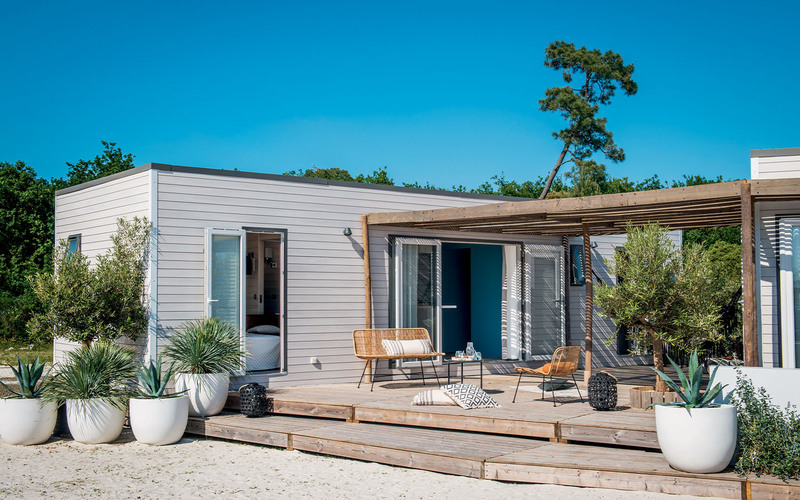 Your mobile home rental also includes a semi-covered terrace. 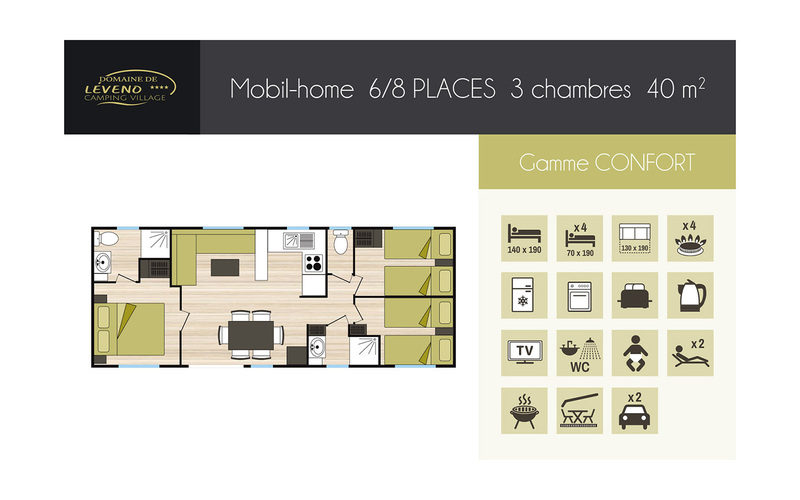 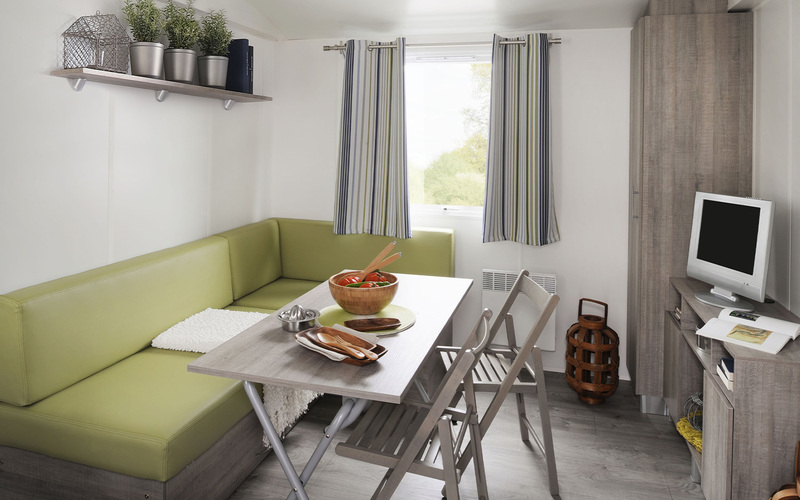 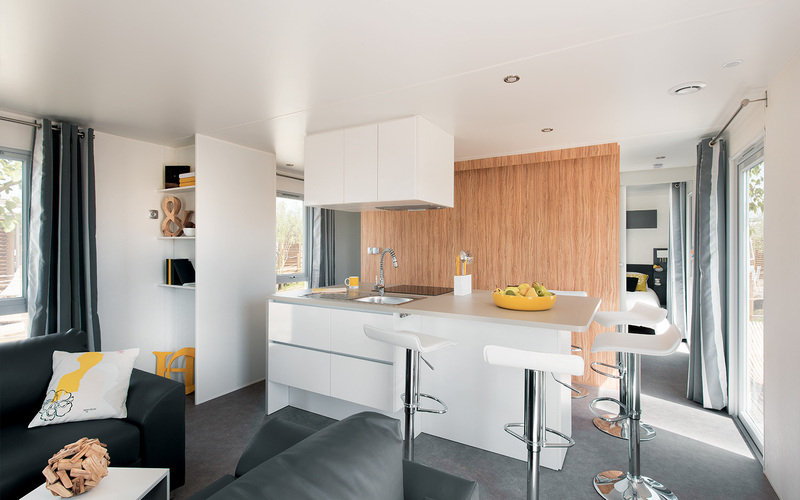 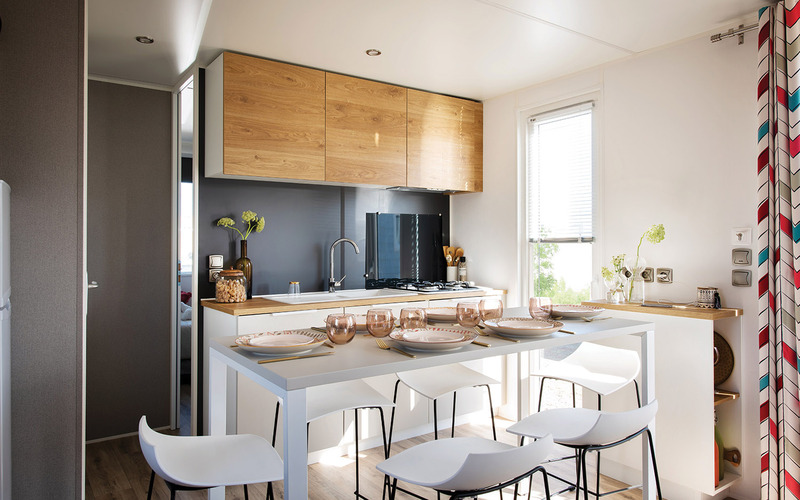 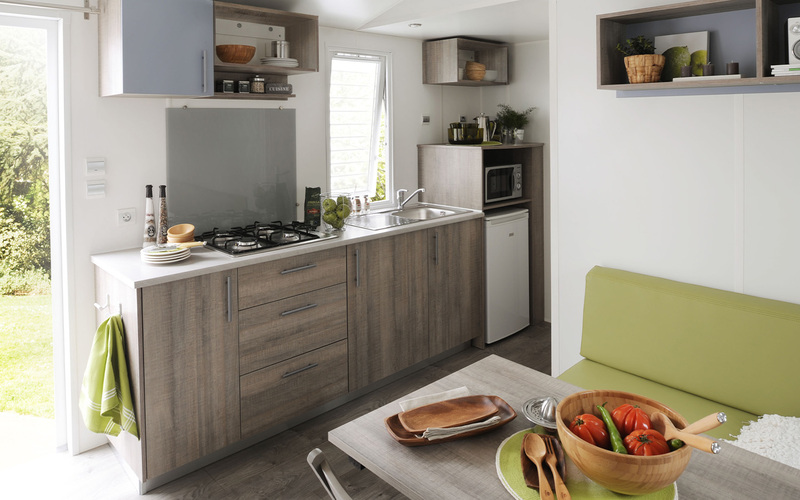 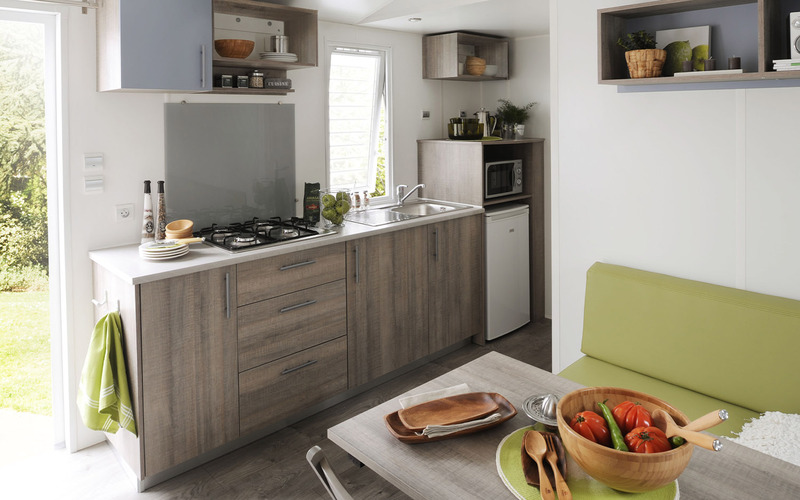 The CONFORT range makes you enjoy all the comforts of the space range (mobile home under 7 years) . 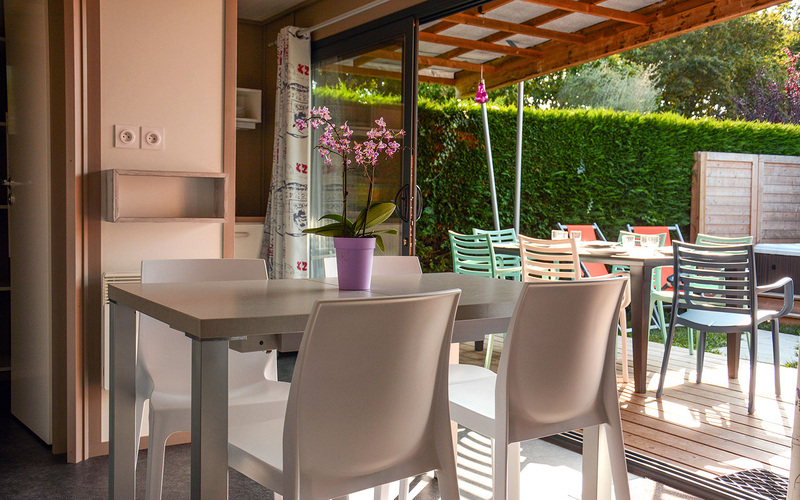 Find more in your rental a TV, a charcoal barbecue and two chiliennes to relax. ADVANTAGES: Television in the living room, charcoal barbecue, 2 chairs, multifunction microwave, toaster, 1 kettle. 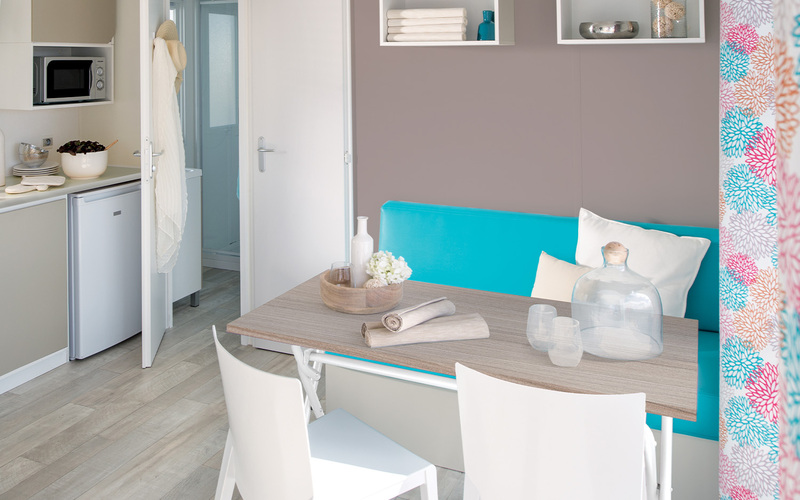 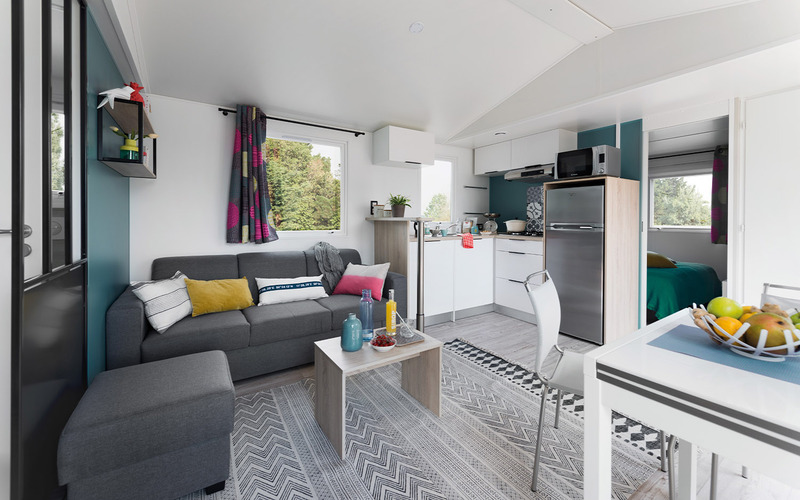 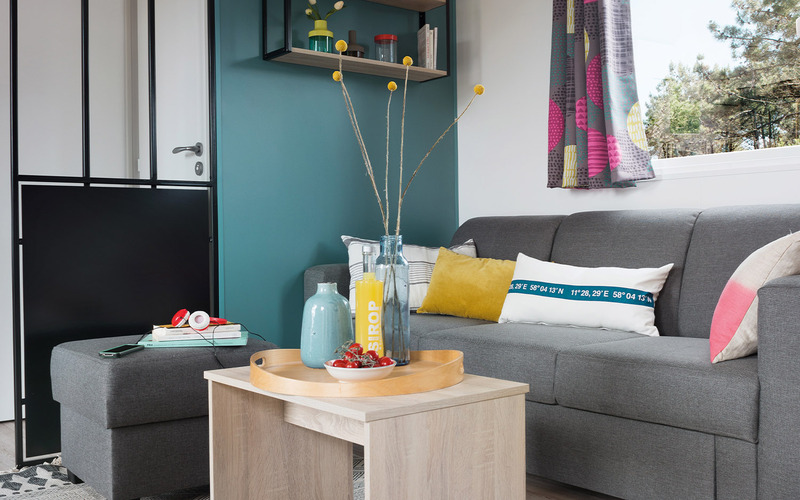 The ESPACE range is the entry level of camping mobile home rentals . 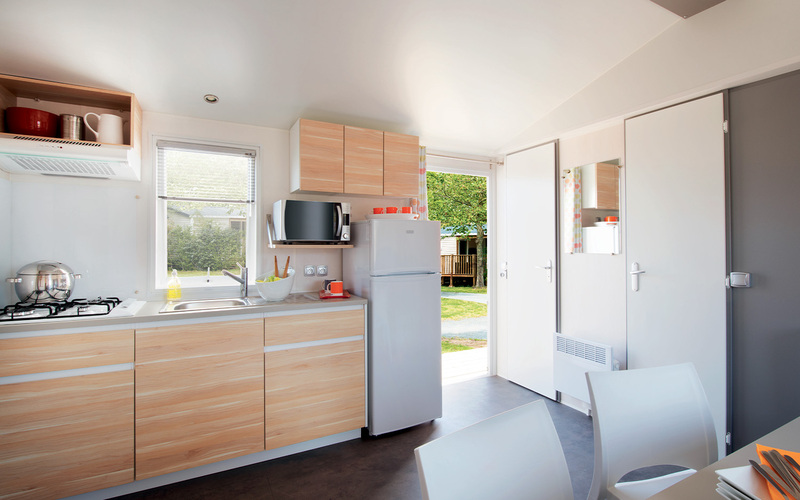 Find bungalows of less than 7 years, well arranged, with all the necessary kitchen and daily life. 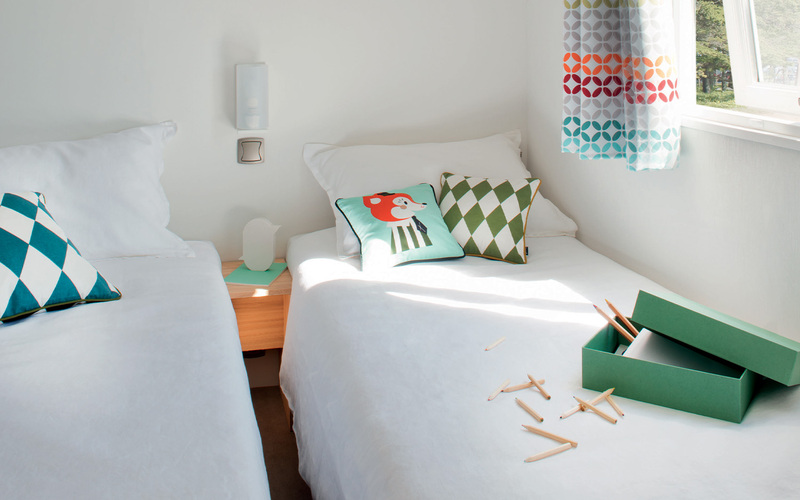 A simple stay and a tariff content. 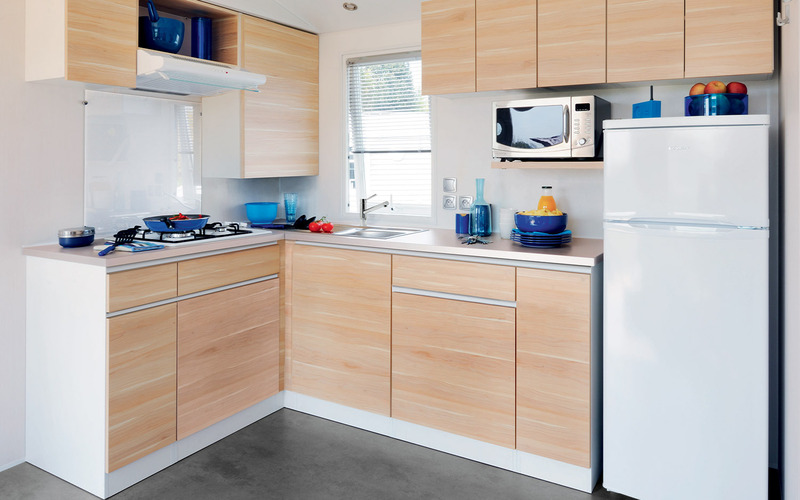 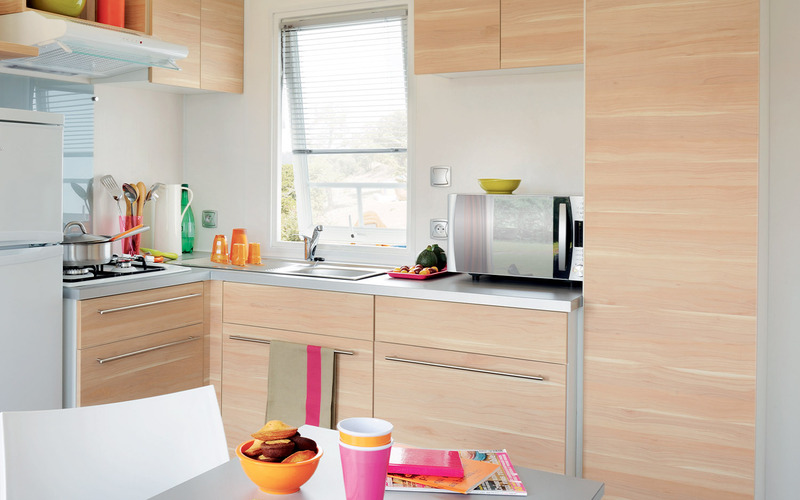 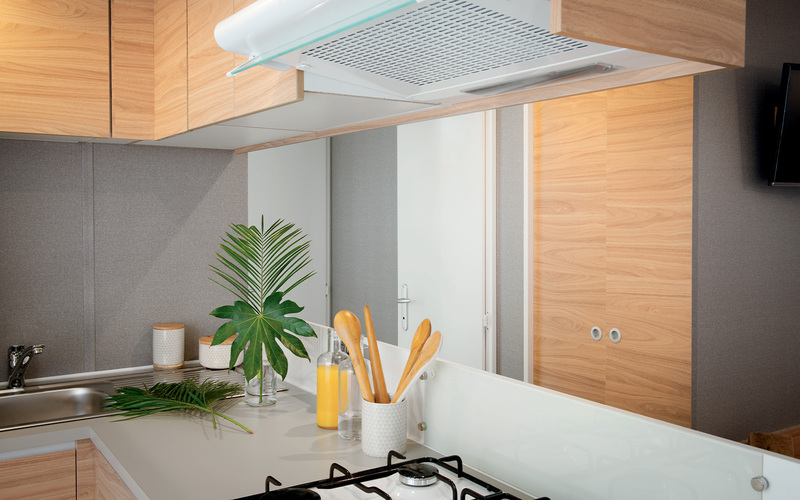 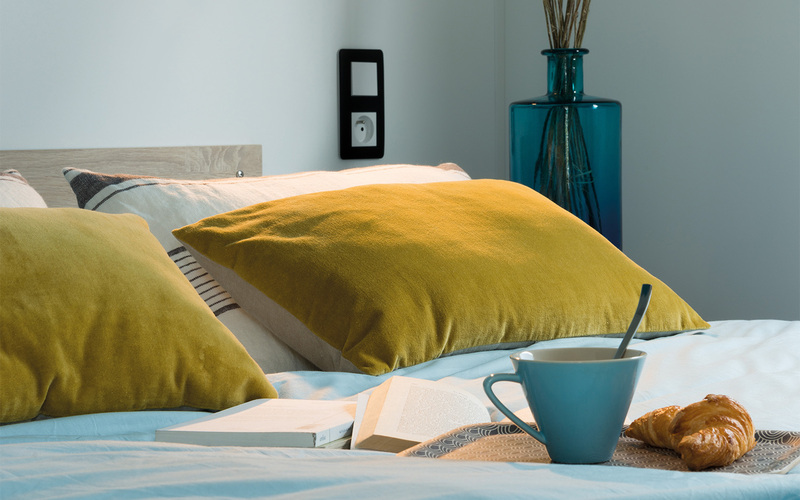 The ECO range is homes over 7 years old without compromising on well-being. 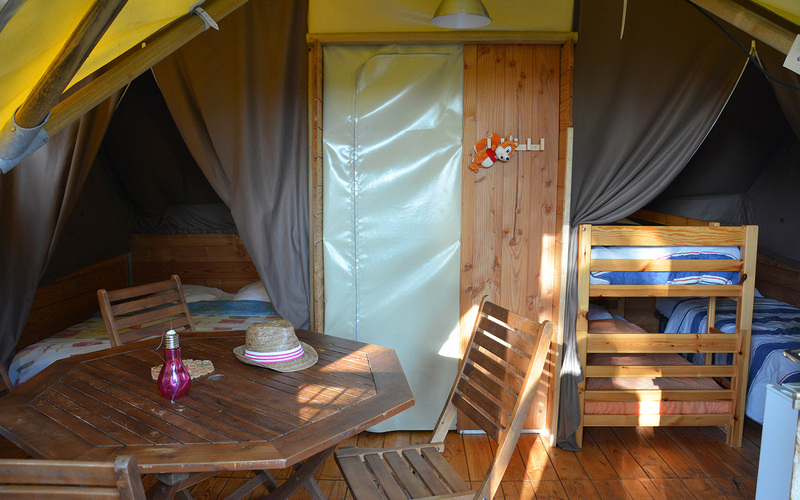 Take advantage of high-end services at the Domaine de Léveno at smart prices with access to cheap camping. 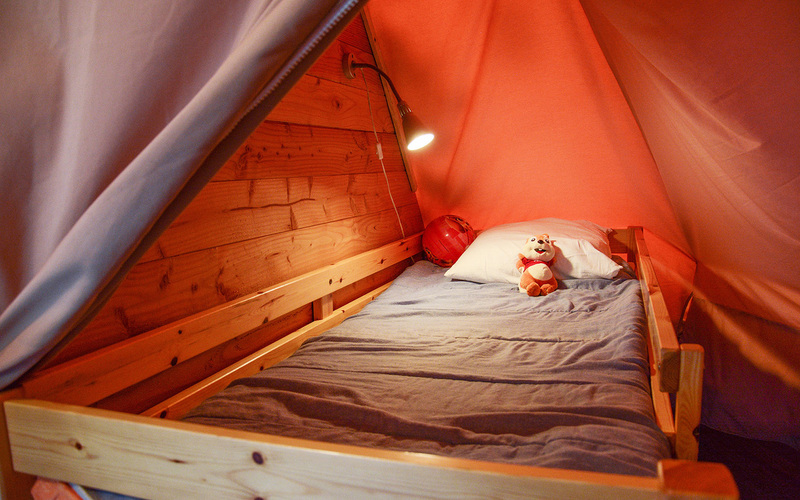 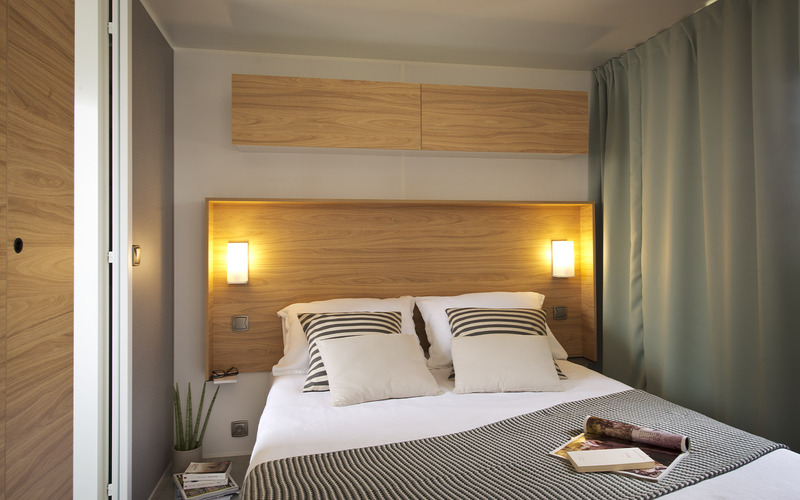 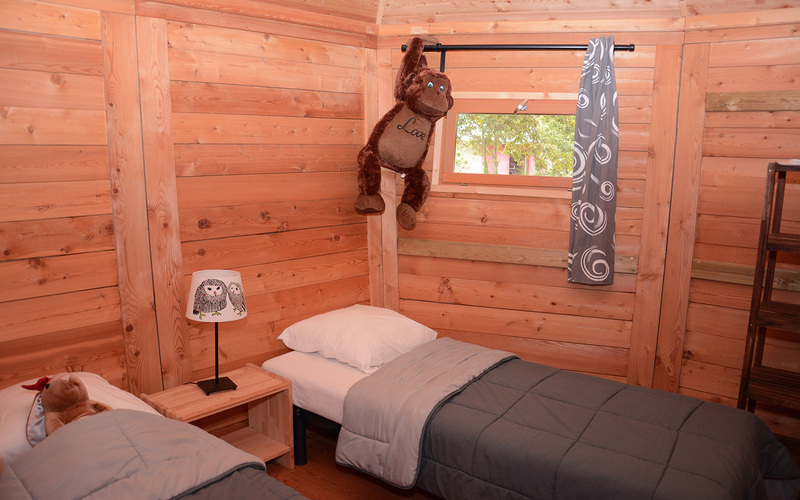 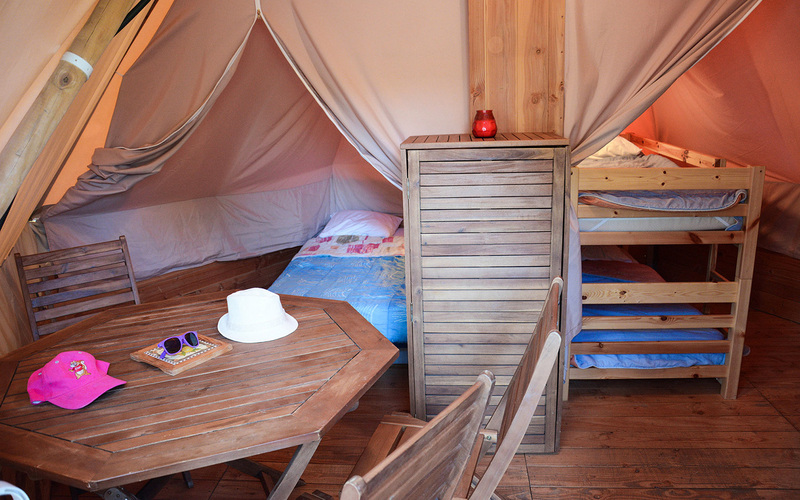 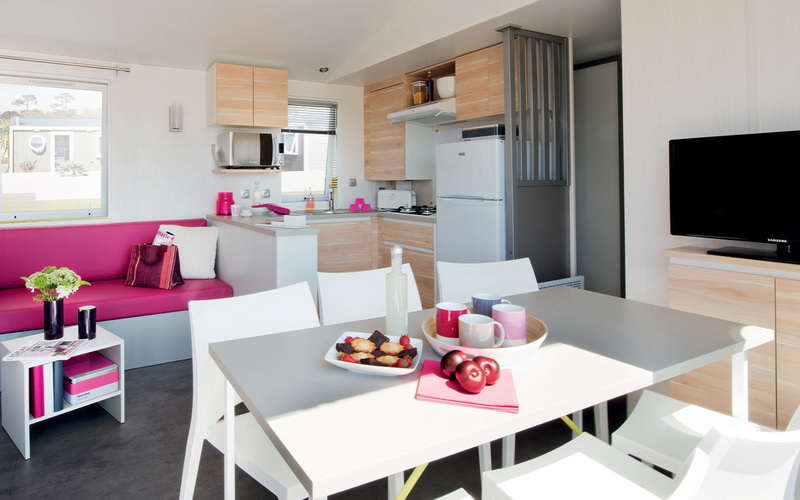 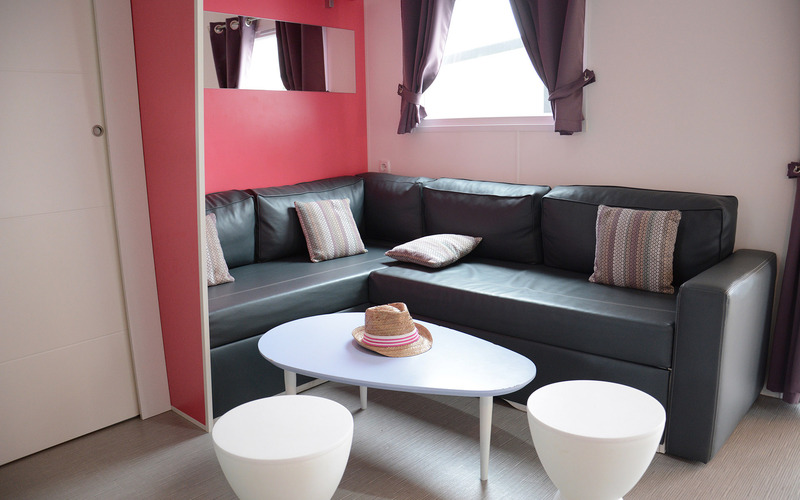 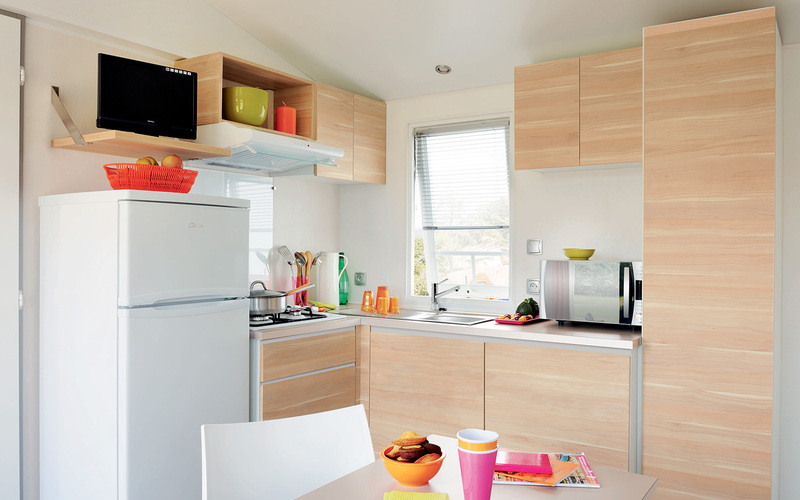 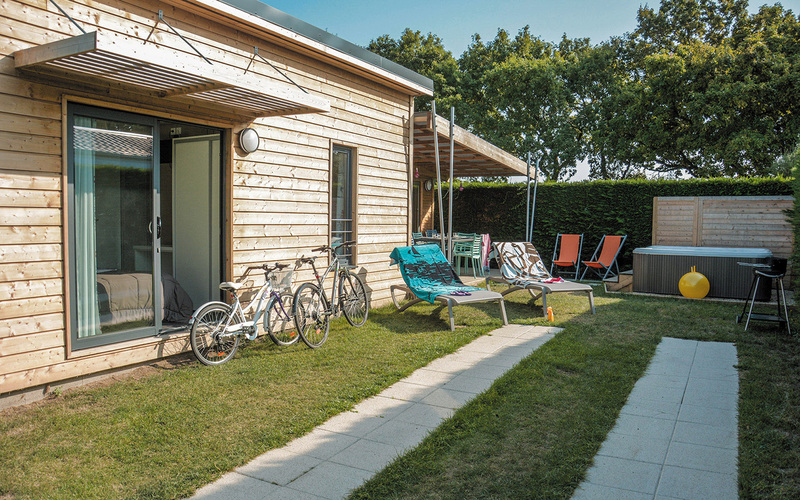 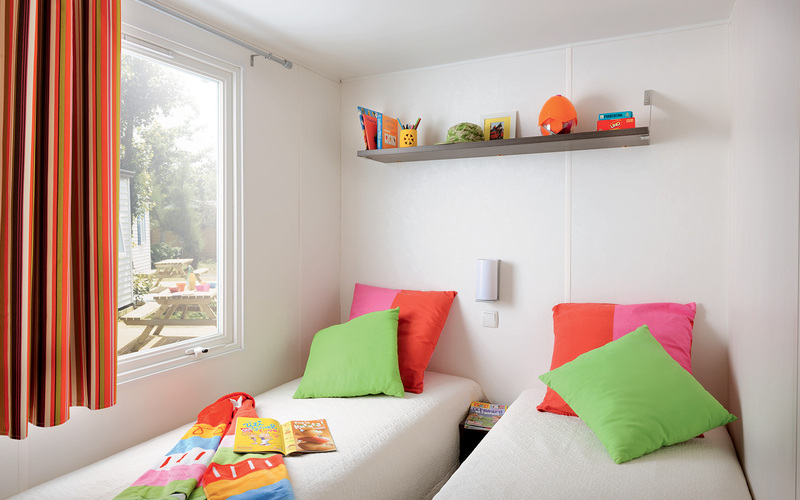 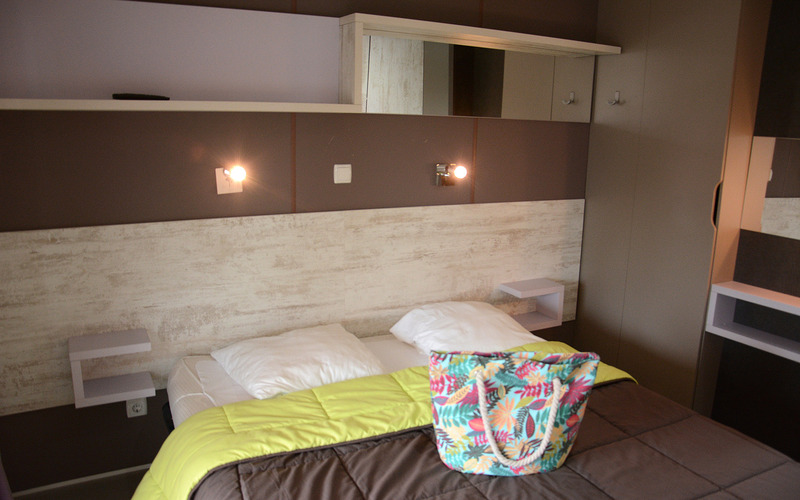 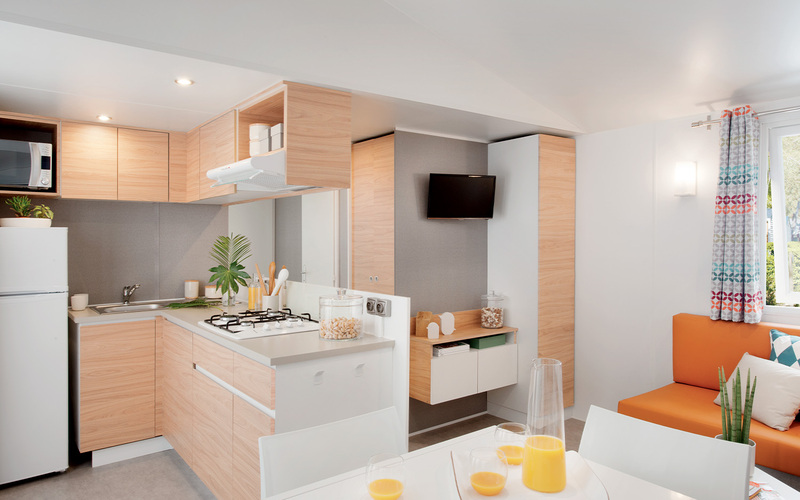 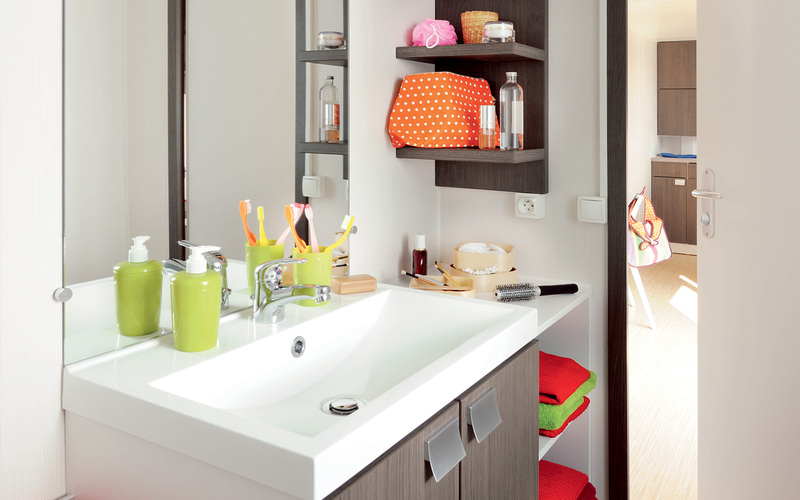 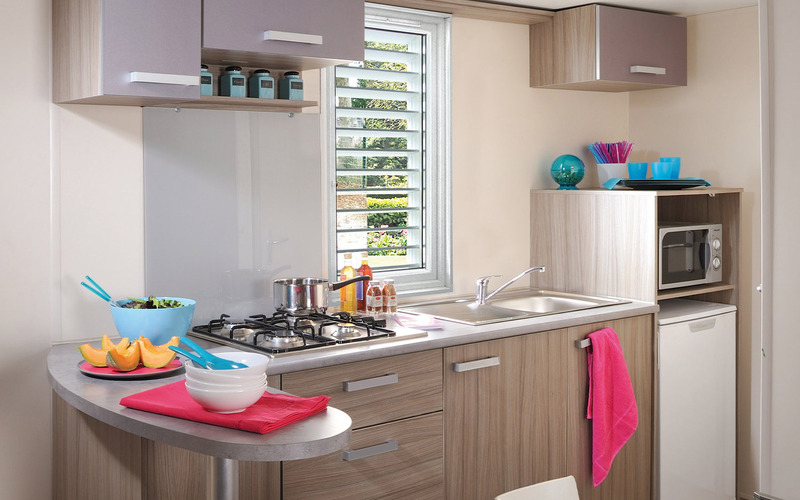 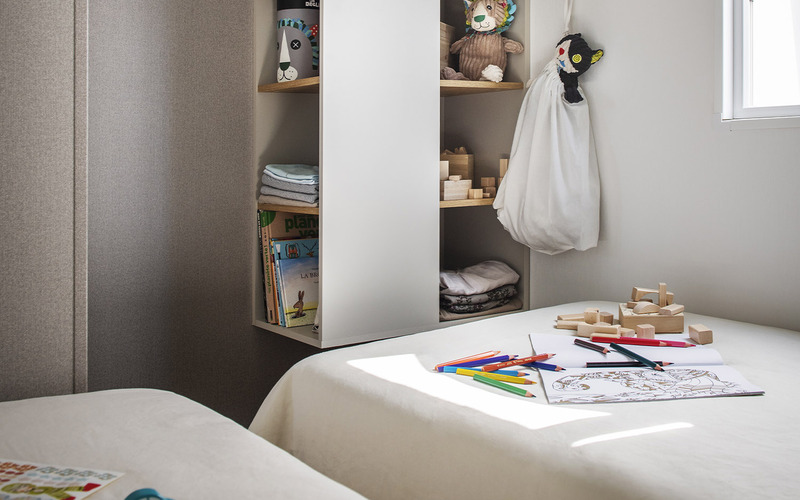 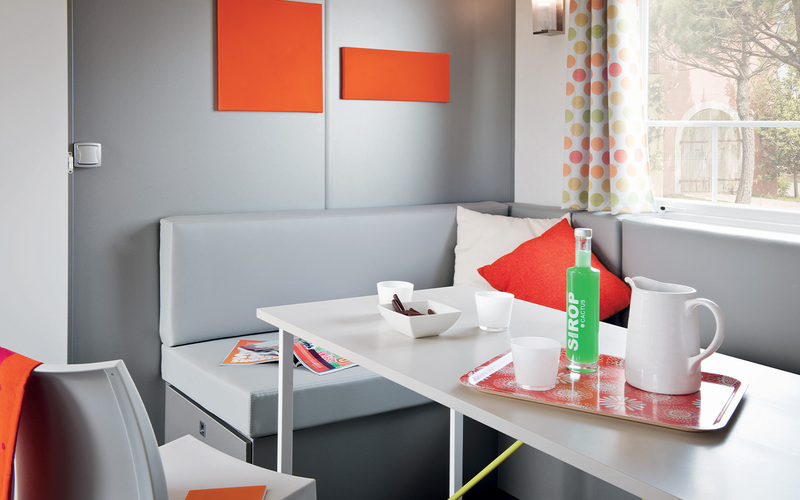 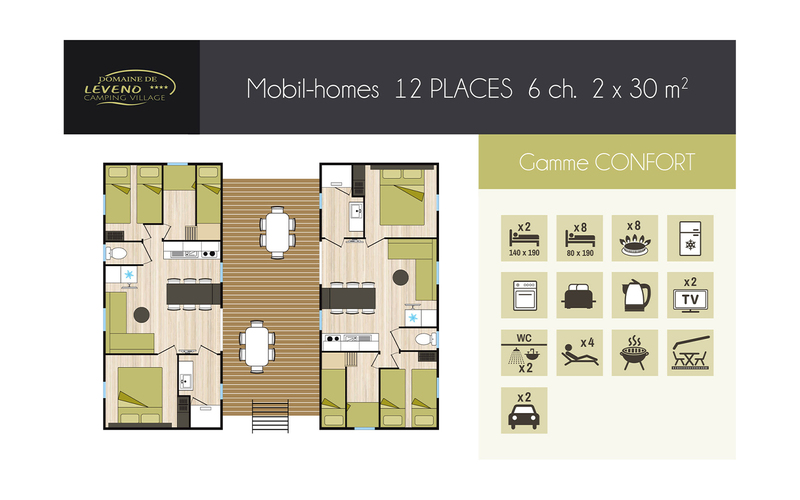 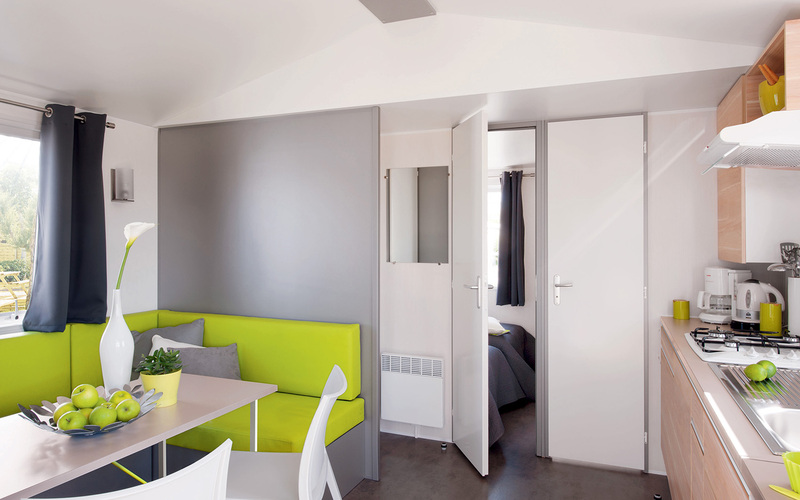 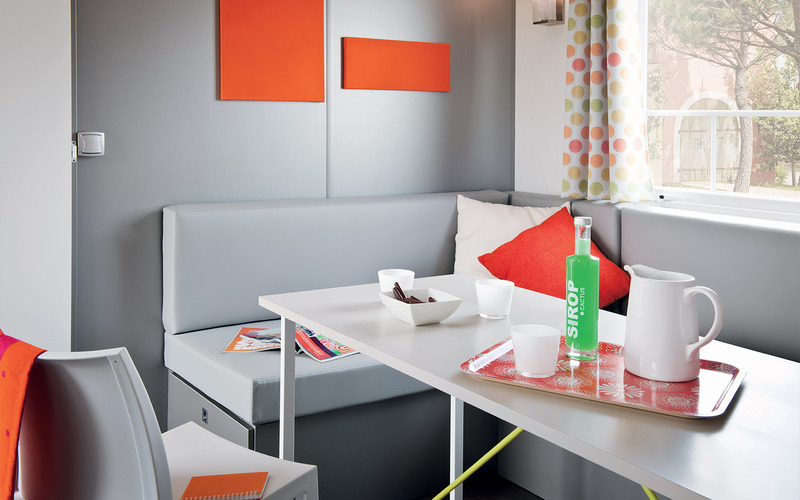 The INSOLITE range offers you another holiday mode , a rental that appeals to children and brings you closer to nature. 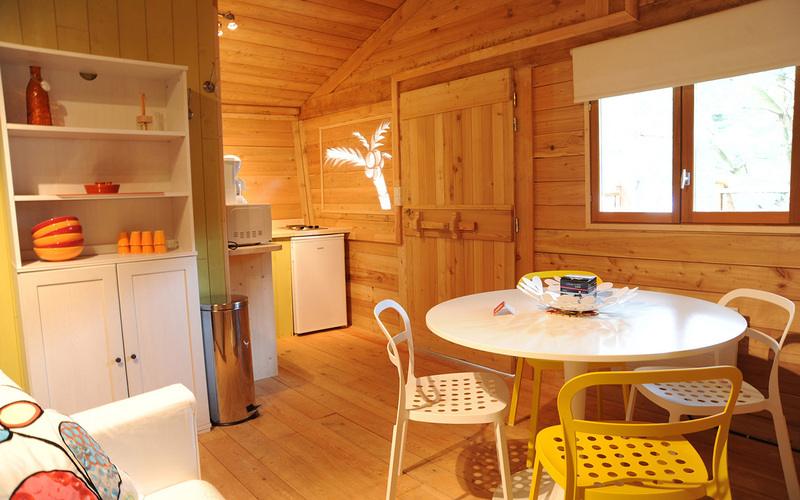 Be careful, only the huts perched in the trees are heated. 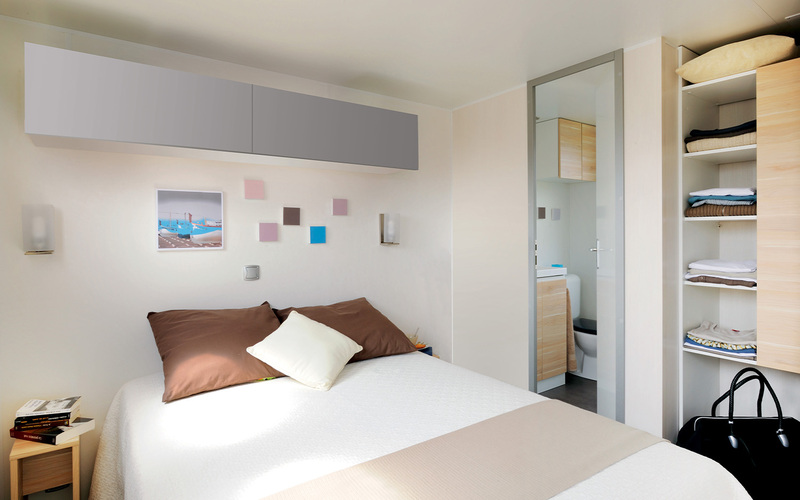 ADVANTAGES: Unique experience at an unbeatable price. 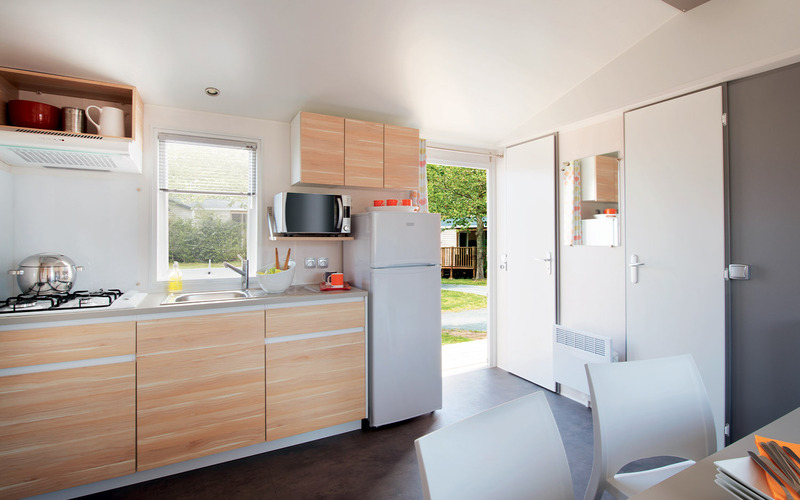 Cook equipped, WC.